U.S. 14 runs from the East Entrance of Yellowstone National Park east to U.S. 41 (Lake Shore Drive) in Chicago, Illinois. There is an Alternate U.S. 14 between Cody and Burgess Junction. U.S. 14 follows State Control Route 31 from Yellowstone National Park to Greybull, State Control Route 37 from Greybull to Burgess Junction, State Control Route 35 from Burgess Junction to Ranchester, Interstate 90 from Ranchester to Sheridan, State Control Route 302 from Sheridan to Wyoming 59, State Control Route 43 from Wyoming 59 to Gillette, Interstate 90 from Gillette to Moorcroft, State Control Route 607 from Moorcroft to Sundance, and Interstate 90 from Sundance to South Dakota. In Sheridan, the business route follows the Interstate 90 Business Loop in that city, via Coffeen Avenue and Big Horn Avenue. State Routes. 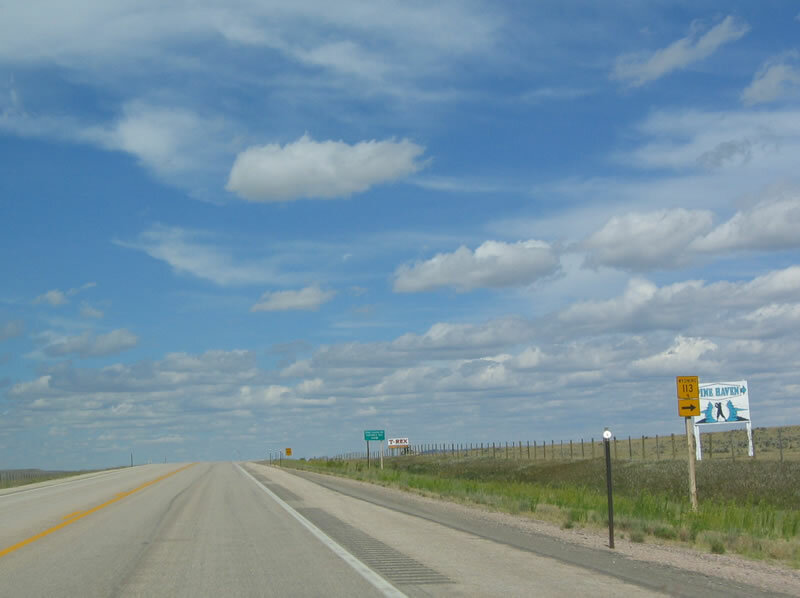 U.S. 14 has/had several auxiliary state routes: Wyoming 14, 114, 414, and 514. If there was an auxiliary Wyo. 214 or 314 (besides the state secondary routes), we have not been able to locate them. U.S. 14 was not one of the original 1926 Wyoming U.S. Routes. 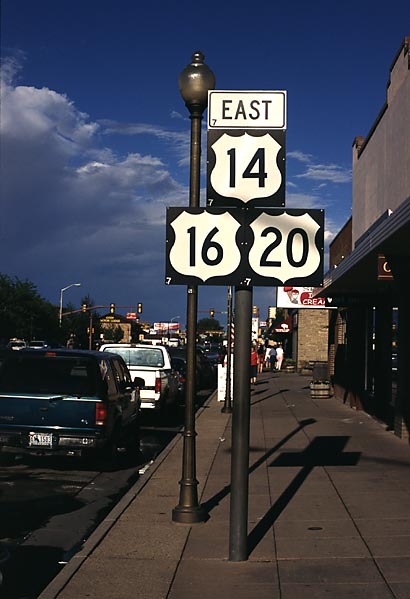 The highway was designated to end at U.S. 16 in Wall, South Dakota, at that time. 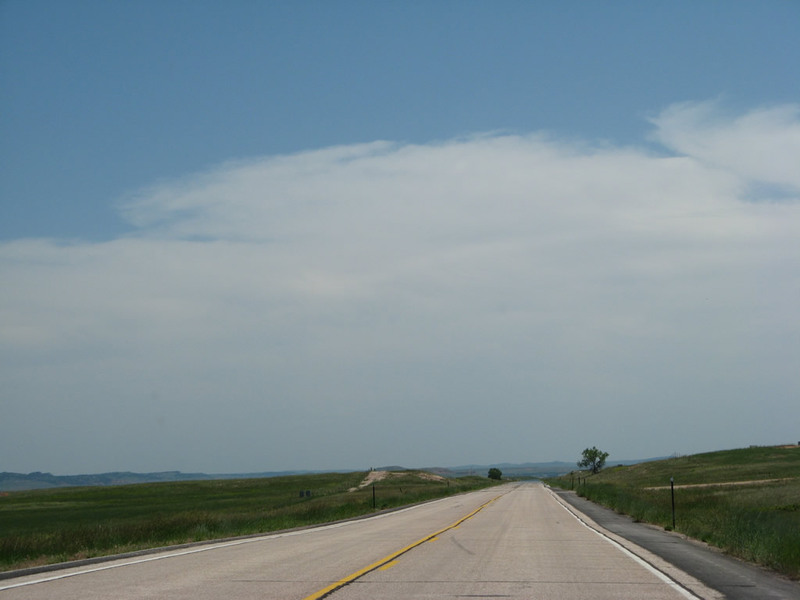 However, in 1936, it was extended via Rapid City, Spearfish, and Sturgis to enter Wyoming. 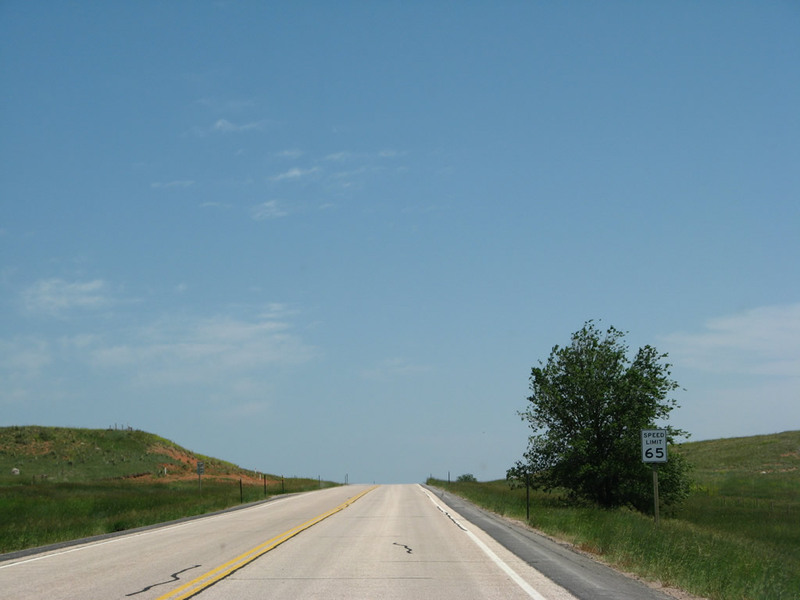 U.S. 16 was rerouted through Custer and Newcastle, while the old U.S. 16 became the new U.S. 14. 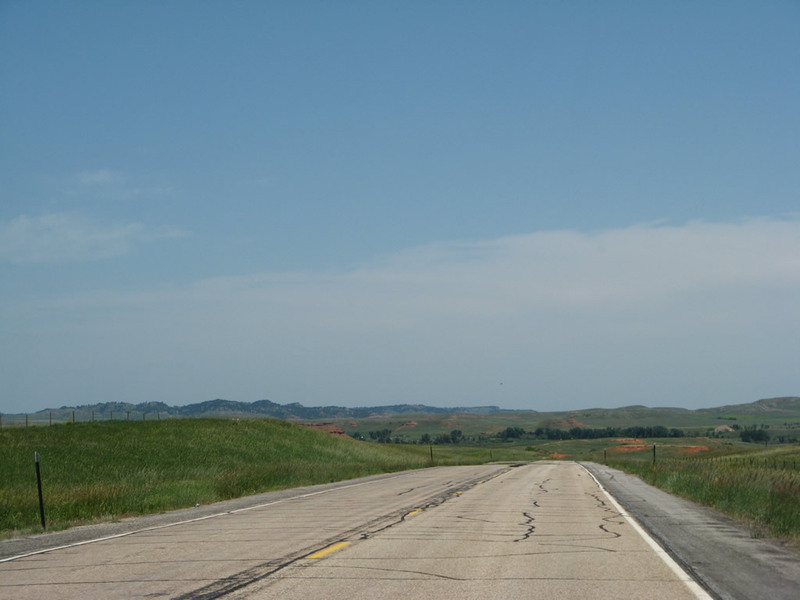 From 1936 through now, U.S. 14 has maintained the same course between Burgess Junction and the South Dakota state line. Of course, in the 1960s and 1970s, the old U.S. 14 became the new Interstate 90 between Sundance and Wall. West of Burgess Junction, U.S. 14 used to follow the current path of U.S. 14A through Lovell and Powell between 1936 and 1940. In 1940, it took over the routing of Wyoming 520 from Greybull to Burgess Junction. In 1940, old U.S. 14 became Wyoming 14. To alleviate confusion, Wyoming 14 was recommissioned as U.S. 14A around 1965 (see Alternate U.S. 14 discussion, above). When U.S. 14 was first designated, it began in Cody; by 1938 it began at the East Entrance to the park. 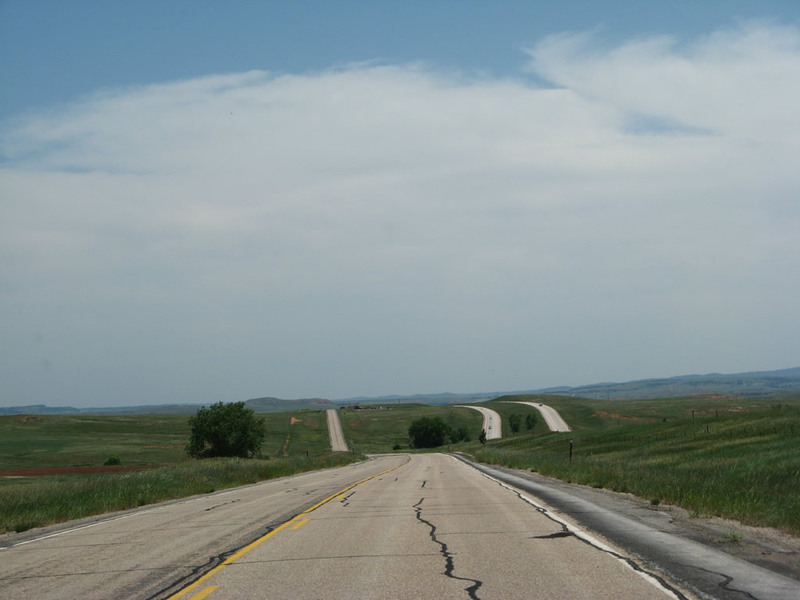 U.S. 14 used to follow Wyoming 338 and Wyoming 345 between Ranchester and Sheridan before Interstate 90 was built. 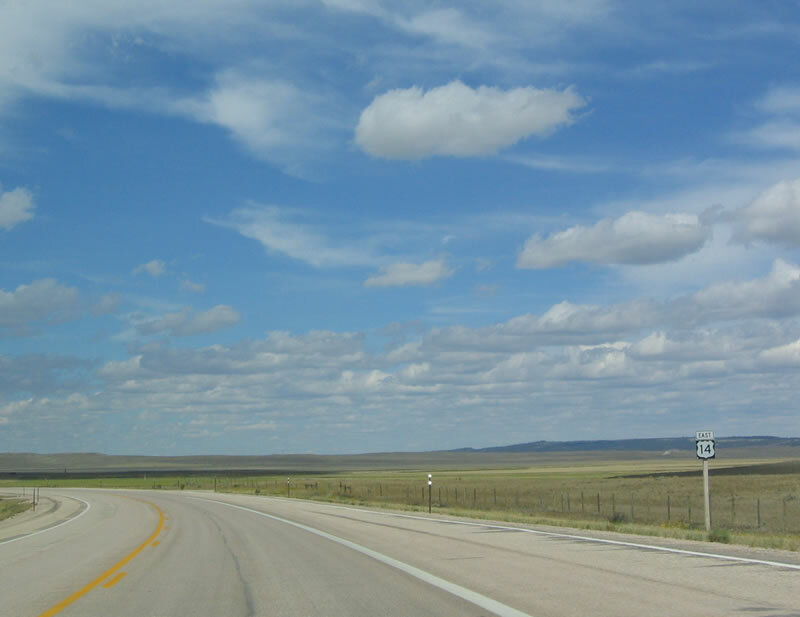 East of Gillette, old U.S. 14-16 is now the secondary state route Wyoming 51. 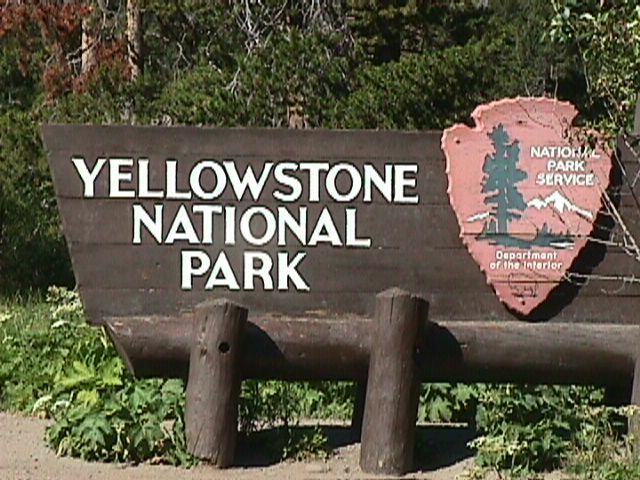 U.S. 14 begins at the East Entrance to Yellowstone National Park. For information on the Grand Loop Road in the park, click here. For the guide to U.S. 14 between the East Entrance and Greybull, check out the guides to U.S. 20 and U.S. 16. 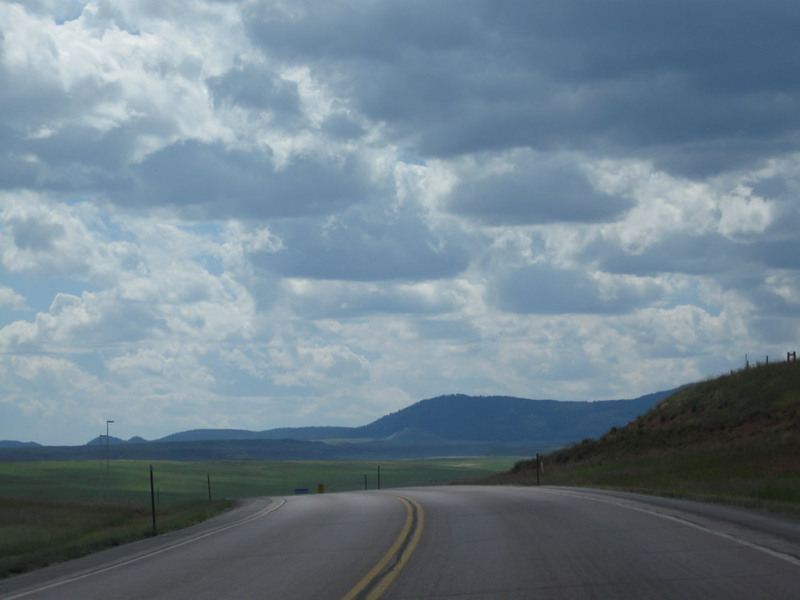 East of Greybull, U.S. 14 ascends the Big Horn Mountains via the Shell Canyon. The canyon provides a natural location for the highway to ascend the mountains, and it is one of the more scenic drives in the state. A waterfall is located along this route too. A State of Wyoming vista point and information center is located along the road in the canyon. At Burgess Junction, U.S. 14 meets U.S. 14A. 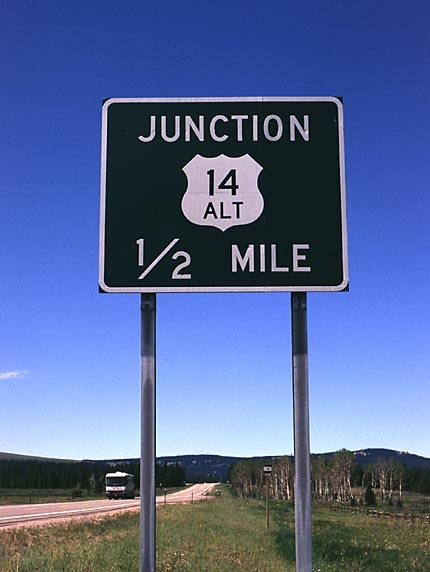 U.S. 14A provides an alternate to U.S. 14 between Cody and Burgess Junction via Powell, Lovell, and Medicine Wheel. When traveling westbound -- toward Yellowstone -- I would take U.S. 14A west to see Medicine Wheel, then turn around to Burgess Junction, then take U.S. 14 through Shell Canyon. Both the Medicine Wheel and Shell Canyon should be seen, yet they are not on the same road. Medicine Wheel, located in the Big Horn National Forest off U.S. 14A, is a mysterious artifact located in a clearing. Some Native Americans believe the site has significant spiritual value, and they administer the Medicine Wheel facility. It is definitely worth a stop along your U.S. 14 tour. U.S. 14 meets Interstate 90 just north of Sheridan, near Ranchester, a small ranching community. U.S. 14 (and U.S. 87) are absorbed by Interstate 90, and they merged until just south of Sheridan. U.S. 14 exits to the southeast toward Ucross, while U.S. 87 exits to its original alignment to serve Story. At Ucross, U.S. 14 merges with U.S. 16 again. U.S. 14-16 travel together in an arc: northeast from Ucross to Arvada, then southeast into Gillette. 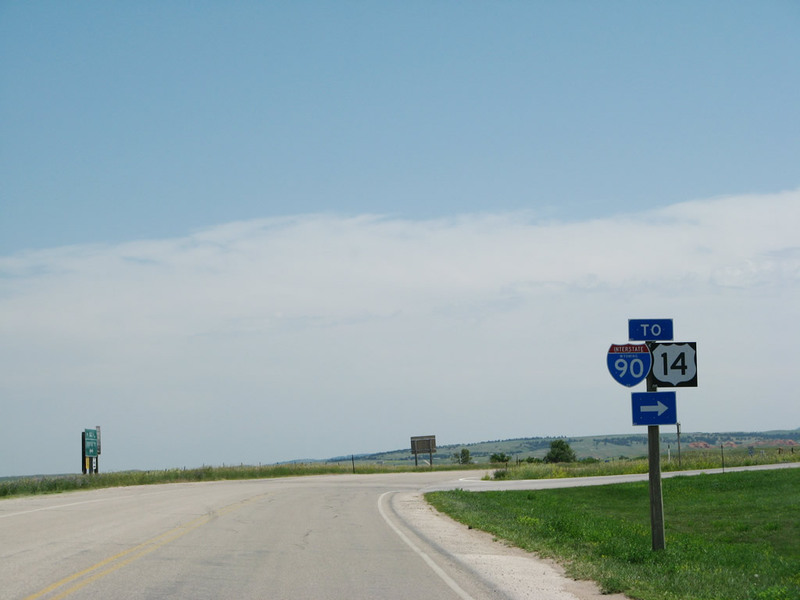 Wyoming 59 intercepts U.S. 14-16 just north of town, then the three routes enter the city proper. U.S. 14-16 are reabsorbed into Interstate 90 at this juncture, while Wyoming 59 heads south toward Wright, Bill, and Douglas. Interstate 90, U.S. 14, and U.S. 16 travel together for a very short time, then U.S. 14 and U.S. 16 break off the interstate at Moorcroft. 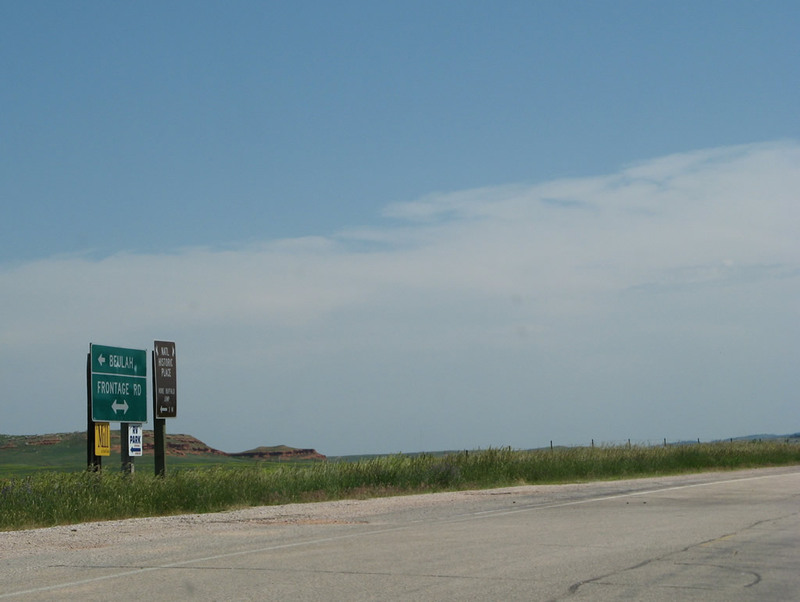 U.S. 14 heads northeast toward Devils Tower, while U.S. 16 heads southeast to Newcastle and Jewel Cave National Monument. Although U.S. 14 does not actually reach Devils Tower National Monument, it does come closer. 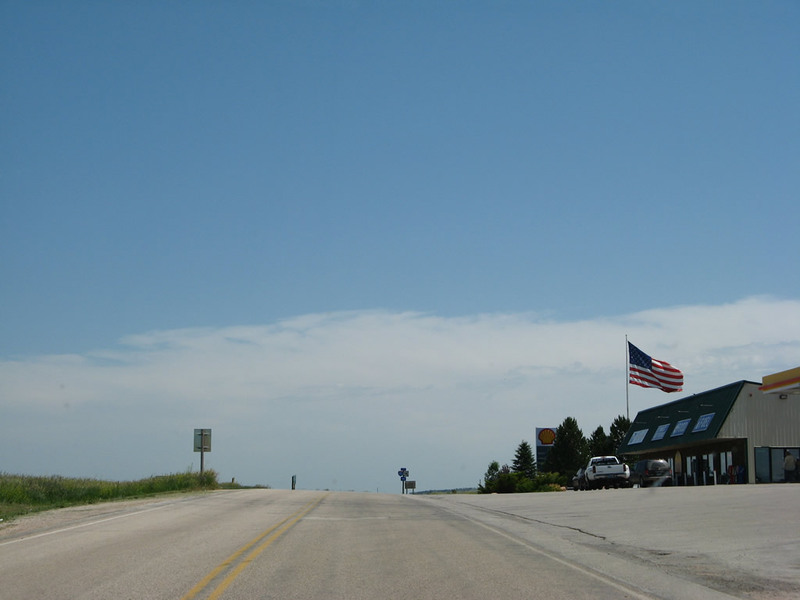 Travelers take U.S. 14 northeast through Carlile to Devils Tower Junction, then follow Wyoming 24 north to Wyoming 110. Wyo. 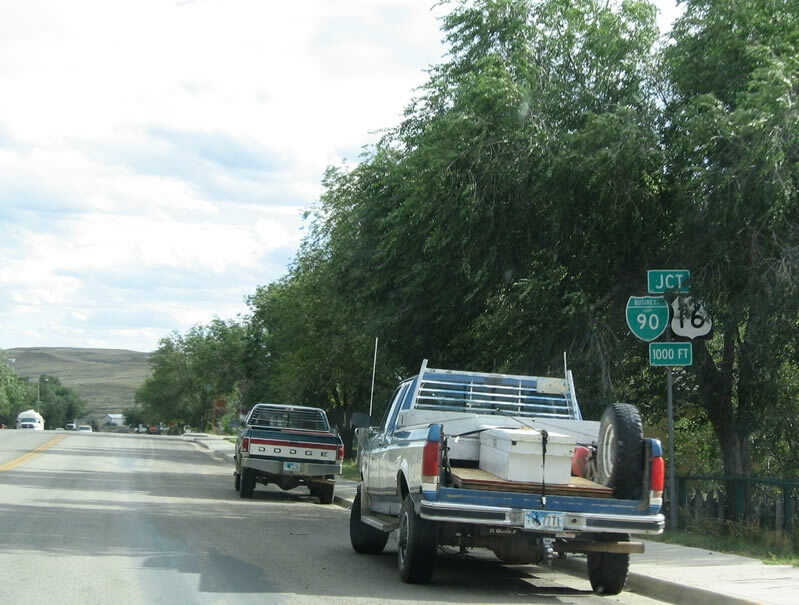 110 is a short spur route that leaves Wyo. 24 and goes to the visitor's center parking lot for Devils Tower. You can't go to the Black Hills and not see Devils Tower. Meanwhile, U.S. 14 heads southeast again to rejoin the interstate. Its principal function between Moorcroft and Sundance is to provide travelers with easy access to Devils Tower. 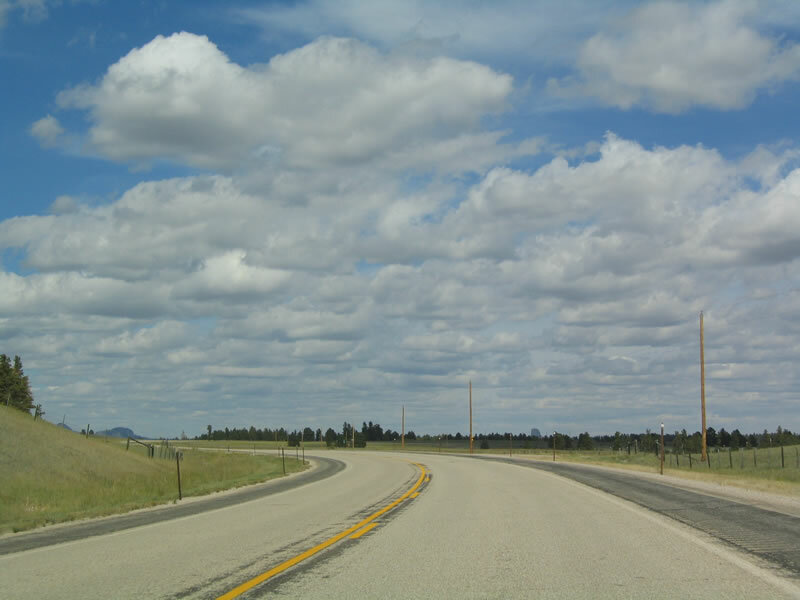 Most through traffic takes Interstate 90, while Black Hills traffic takes U.S. 16. 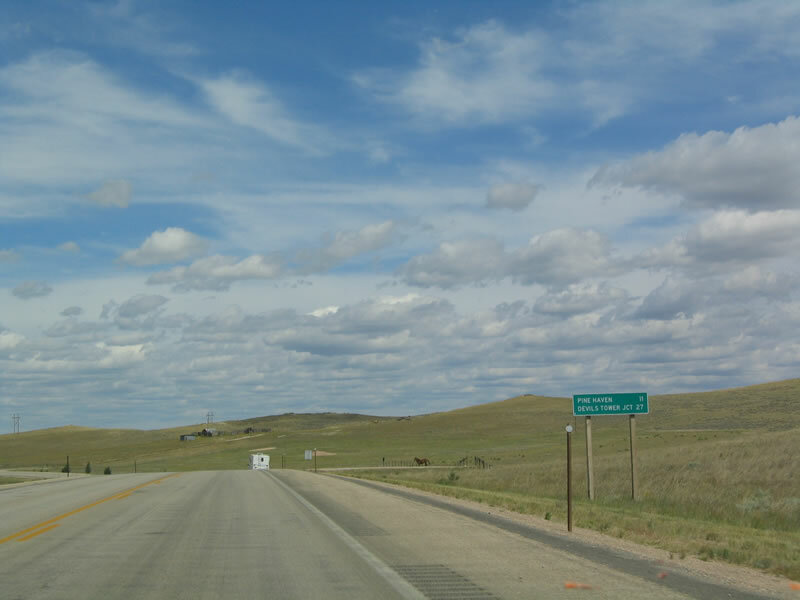 Interstate 90 and U.S. 14 remain merged through the South Dakota state line; the US route does not split off the freeway until Wall, South Dakota. There is an Alt. 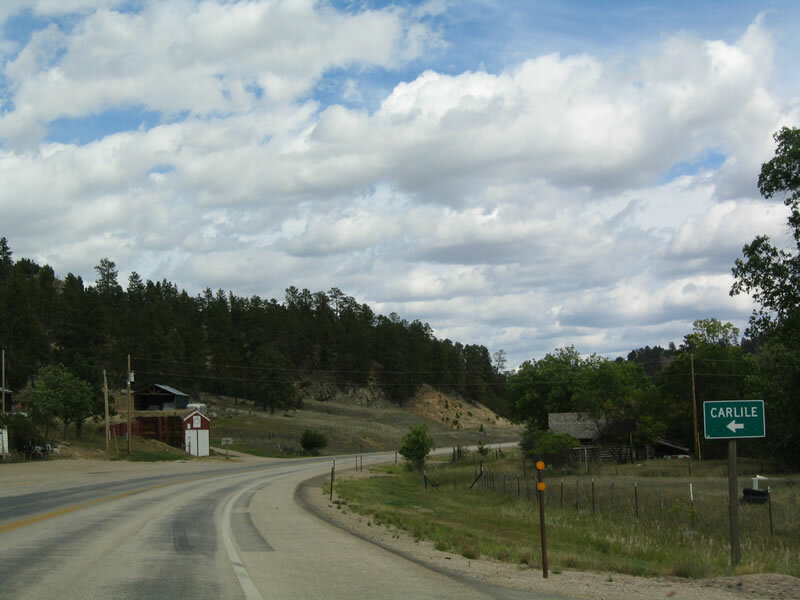 U.S. 14 in the Black Hills region in South Dakota, however, that provides relief from the interstate. West of Cody, eastbound U.S. 14-16-20 approaches its junction with Wyoming 291 (South Fork Road). Wyoming 291 travels southwest past Buffalo Bill Reservoir toward Cedar Mountain. Photo taken by Jonathan Winkler, 8/00. Continuing east, U.S. 14-16-20 enters the town of Cody on North Fork Highway, which turns north onto 8th Street, then turns east again via Sheridan Avenue. This is the view of Sheridan Avenue eastbound as seen from prior to the 11th Street traffic signal. Photo taken by Jonathan Winkler, 8/00. Cody is a major gateway into Yellowstone National Park, as U.S. 14-16-20 connect it with the east entrance to Yellowstone. 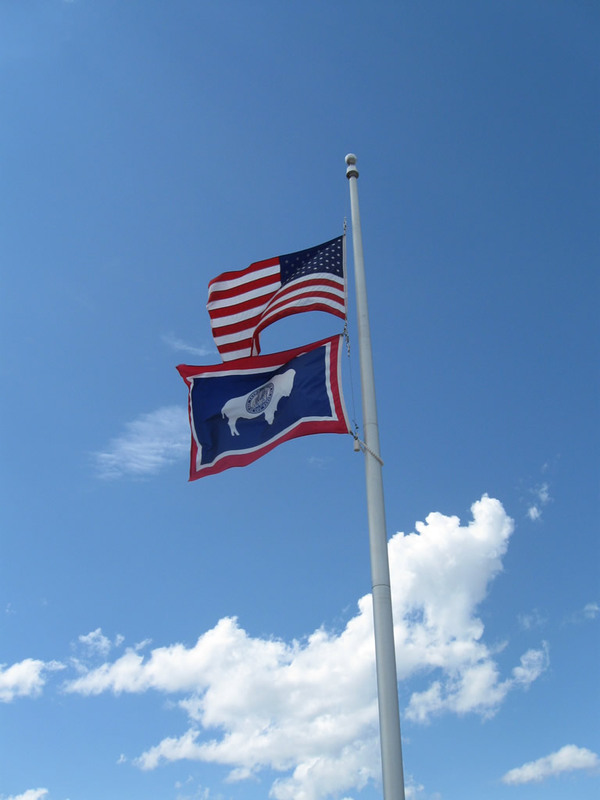 In addition, Cody is situated near the scenic Chief Joseph (Wyoming 296) and Beartooth (U.S. 212) Highways. 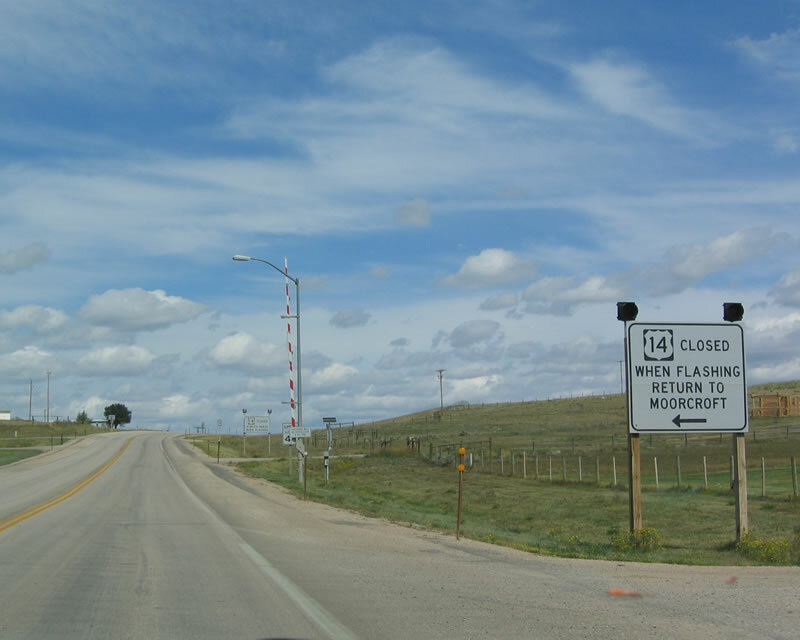 These pictures show Cody along U.S. 14-16-20, including some speed limit signage and shields, including the brief section where the three U.S. routes are merged with Wyoming 120 and a developing thunderstorm in the distance. Photo taken by Jonathan Winkler, 8/00. This reassurance shield for U.S. 14-16-20 is located along Sheridan Avenue in downtown Cody. Photo taken by Jonathan Winkler, 8/00. At the point where Sheridan Avenue reaches 17th Street, U.S. 14-16-20 and Wyoming 120 east turn south onto 18th Street, which transitions onto Greybull Highway. This trailblazer sign is posted at the intersection between Sheridan Avenue and 17th Street. Photos taken by Jonathan Winkler, 8/00. 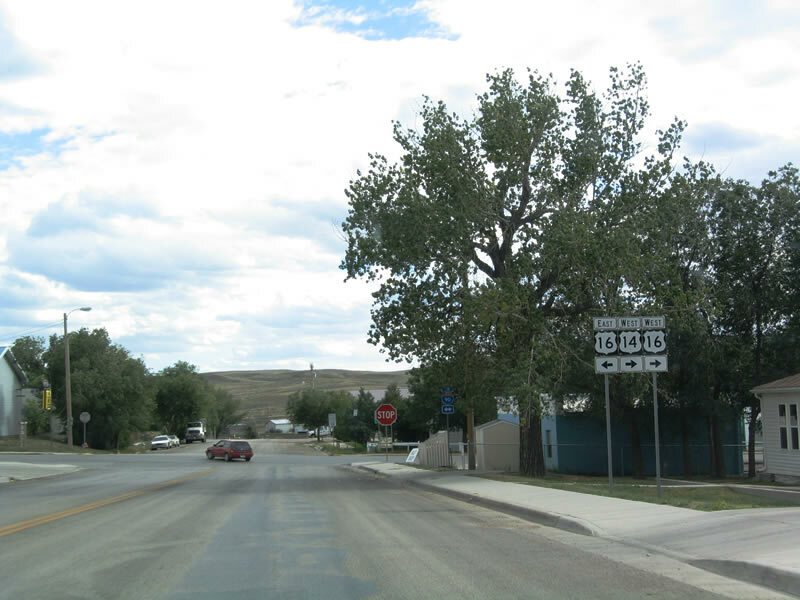 Near downtown Cody, eastbound U.S. 14-16-20 reaches its junction with Alternate U.S. 14 and Wyoming 120. Continue straight ahead on Sheridan Avenue to follow U.S. 14-16-20 east toward Greybull, Worland, and Thermopolis. 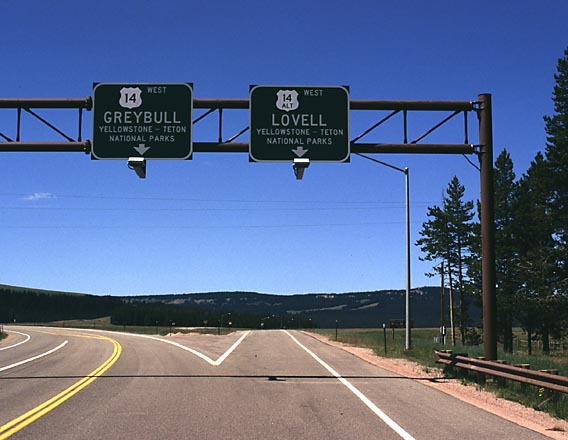 U.S. 14 splits from U.S. 16-20 at Greybull; U.S. 16 splits from U.S. 20 at Worland, and U.S. 20 travels south through Thermopolis in Hot Springs County before turning east at Shoshoni to follow U.S. 20-26 toward Casper. Photo taken by Rich Piehl, 5/01. U.S. 16-20 split off of U.S. 14 at Greybull. Near Burgess Junction, U.S. 14 east reaches its junction with Forest Service Road 15 after emerging from Shell Canyon east of Greybull. Photo taken by Jonathan Winkler, 8/00. U.S. 14 rejoins with Alternate U.S. 14 at Burgess Junction. Alternate U.S. 14 travels west from here toward Medicine Wheel and Lovell before merging back onto U.S. 14 at Cody. U.S. 14 continues east toward Dayton and Ranchester, where it merges onto Interstate 90 east toward Sheridan. Photo taken by Jonathan Winkler, 8/00. 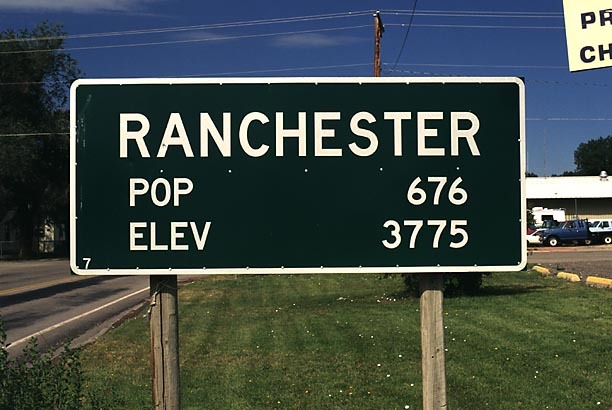 U.S. 14 enters the community of Ranchester near its junction with Interstate 90 and U.S. 87. Photo taken by Jonathan Winkler, 8/00. 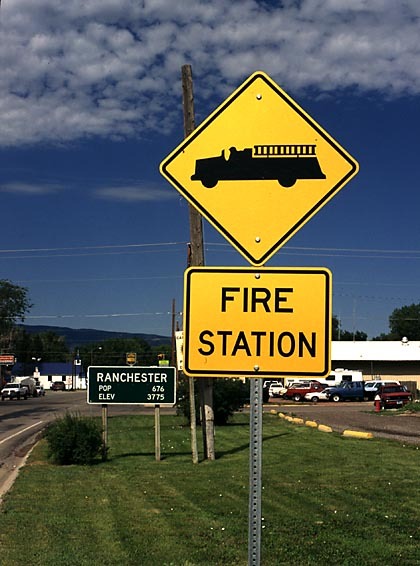 This signage is posted along eastbound U.S. 14 at a fire station in Ranchester. Continuing east, U.S. 14 merges onto Interstate 90 and U.S. 87 northwest of Sheridan. Photo taken by Jonathan Winkler, 8/00. For photos, see Business Loop Interstate 90 Wyoming in Moorcroft. 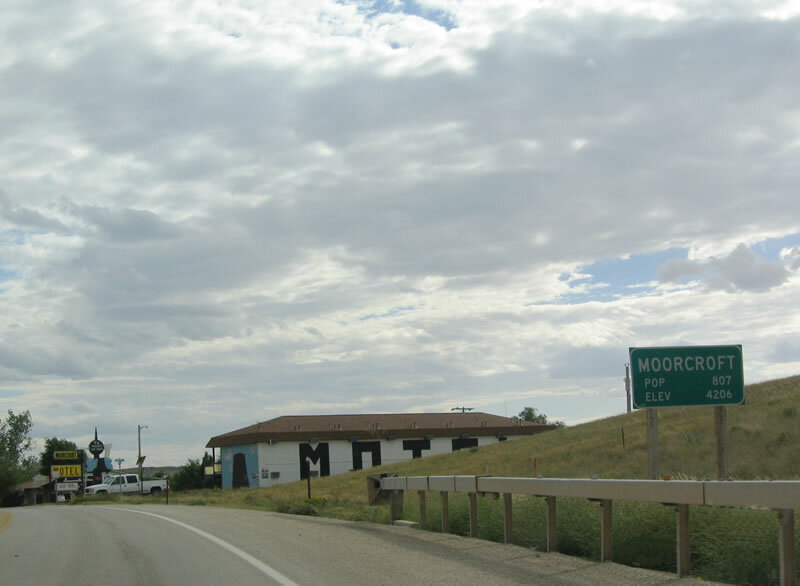 U.S. 14 leaves Moorcroft via North Yellowstone Avenue, passing by the Moorcourt Motel as the U.S. highway leaves town. Follow U.S. 14 northeast to Devils Tower. Photo taken 09/01/04. Like other rural roads in the state, U.S. 14 closes during periods of inclement weather. 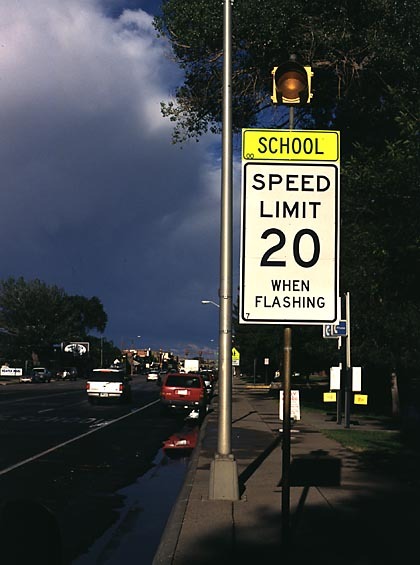 During these times, the lights on this sign will be illuminated, and it is illegal for anyone to drive on the highway while the road is signalized as being closed. Photo taken 09/01/04. 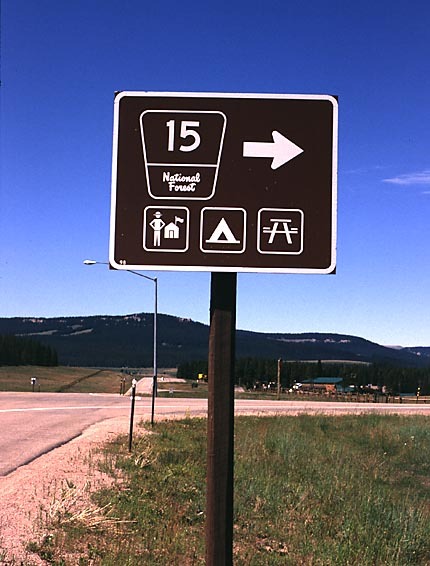 This mileage sign provides the distance to Pine Haven via Wyoming 113 and Devils Tower Junction, which is where U.S. 14 and Wyoming 24 converge. Devils Tower itself is another six miles north of Devils Tower Junction via Wyoming 24 and Wyoming 110. Photo taken 09/01/04. A single shield assembly is the first warning of the pending junction with Wyoming 113, Pine Haven Road. Use Wyoming 113 east to Pine Haven and Keyhole State Park. The park offers water-based recreational opportunities on the approximately 14,720 square foot reservoir. 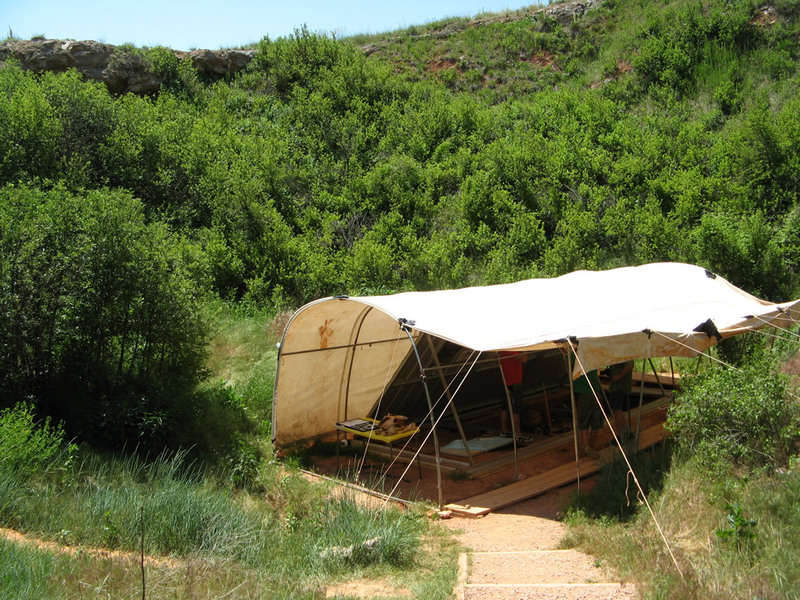 Fishing, swimming, camping, hiking, and picnicking are among the available activities. Photo taken 09/01/04. 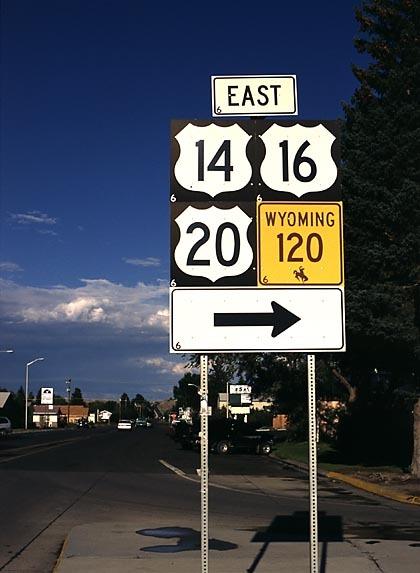 Eastbound U.S. 14 reaches eastbound Wyoming 113. 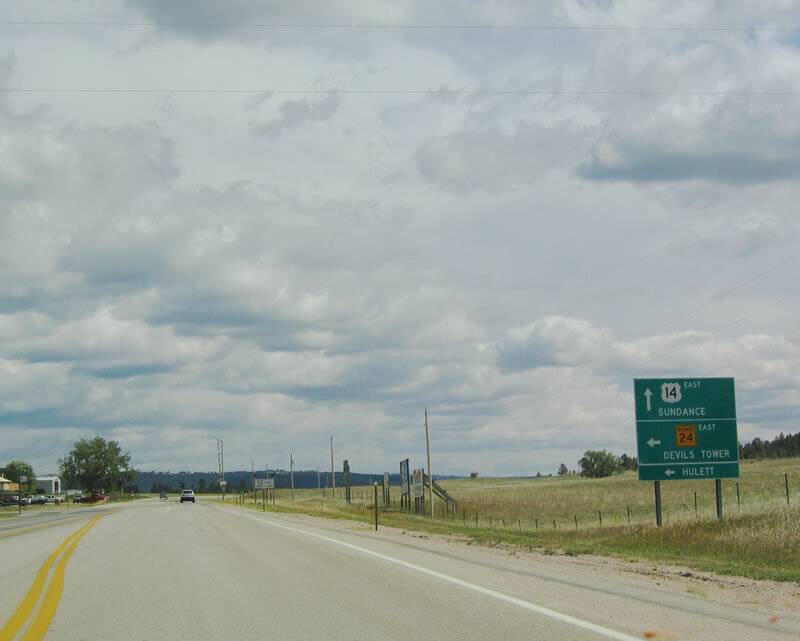 Wyoming 113 ends at Pine Haven and does not return to Interstate 90. Photo taken 09/01/04. After the junction with Wyoming 113 is this reassurance shield along eastbound U.S. 14. In actuality, U.S. 14 is traveling due north as it passes by Keyhole Reservoir. The Powder River Basin spreads out to the west of here, while the western edge of the Black Hills spreads out to the northeast. Photo taken 09/01/04. 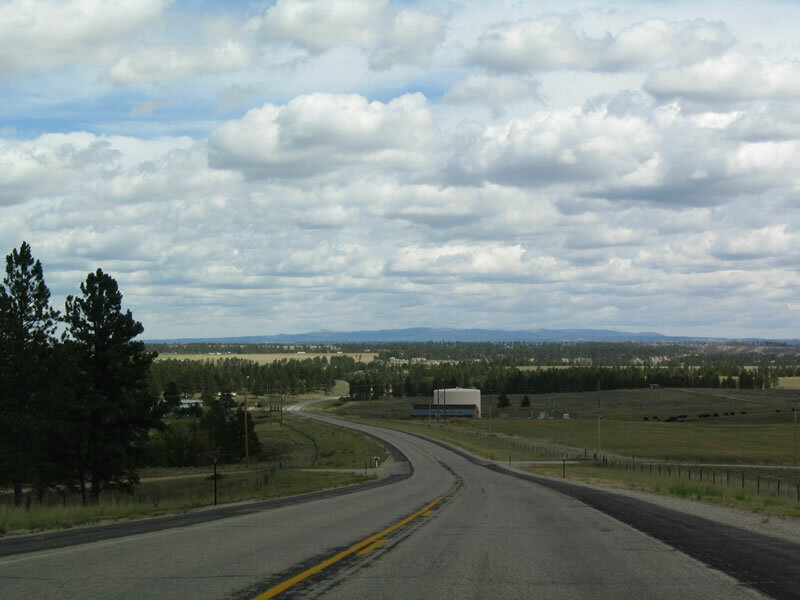 U.S. 14 is long and straight as it travels north, leaving the Powder River Basin and entering the Black Hills of Wyoming. The dense forest ahead helps to give the Black Hills its name when compared to the surrounding sagebrush prairie. Photo taken 09/01/04. Upon entering the mountainous area, the highway begins to wind its way as it gains elevation. Photo taken 09/01/04. Reaching a rise in the roadway, the trees part for a series of valleys. Photo taken 09/01/04. 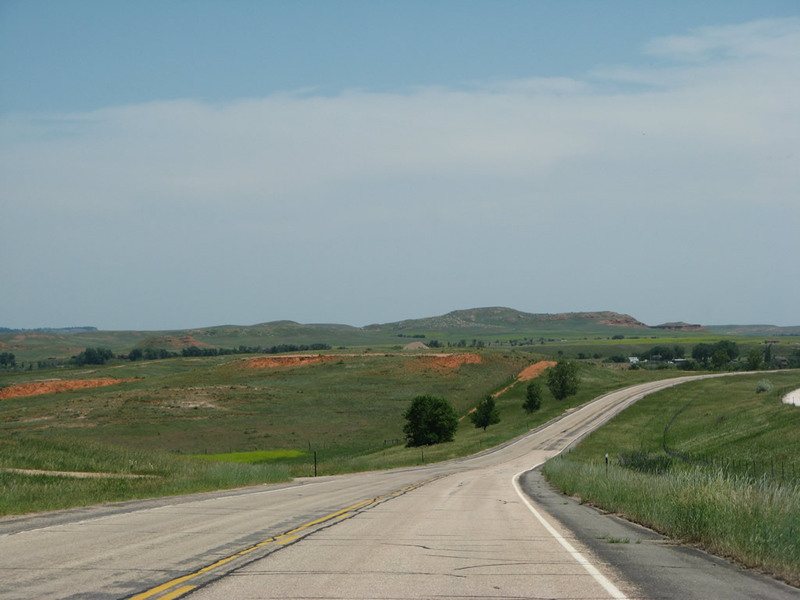 Sandstone cliffs appear in the distance as U.S. 14 rounds another bend within the Black Hills. Photo taken 09/01/04. Devils Tower, which is the destination of many travelers on this stretch of U.S. 14 (since Interstate 90 is a more direct route between Moorcroft and Sundance), comes into view as the road passes over another summit. Look to the right in the photo to see the famous volcanic mountainous plateau; keep in mind that U.S. 14 is generally traveling north or northeast between Keyhole Reservoir and Carlile. Photo taken 09/01/04. The town of Carlile comes into view, with its handful of buildings and limited services. Photo taken 09/01/04. A small sign indicates that eastbound U.S. 14 has reached the community of Carlile. U.S. 14 shifts from northeast to east as it turns toward the Oshoto turnoff and Devils Tower Junction. Photo taken 09/01/04. Oshoto is not located on eastbound U.S. 14; it is located to the northwest of Carlile via local roads (Cabin Creek Road west to Oshoto Road). East of here, U.S. 14 is also known as the continuation of Cabin Creek Road. Photo taken 09/01/04. 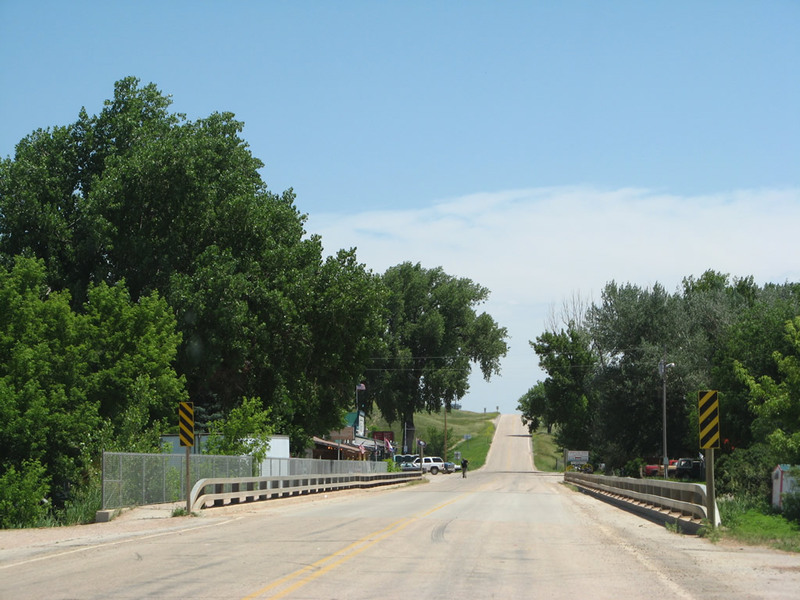 U.S. 14 crosses the Belle Fourche River. This river flows from Keyhole Reservoir to the northeast, passing by Devils Tower, Hulett, and even Colony before turning southeast again to pass through the city of Belle Fourche, South Dakota. Photo taken 09/01/04. The next major intersection along eastbound U.S. 14 is the junction with Wyoming 24. Wyoming 24 travels north to Devils Tower, then turns east at Hulett en route to Alva and Aladdin. 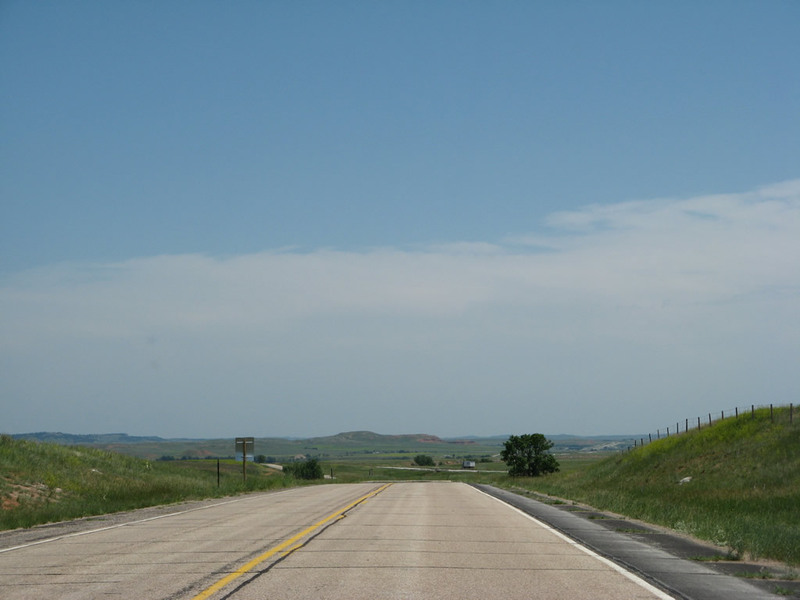 Wyoming 24 directly connects with South Dakota 34, which travels east toward Belle Fourche and Whitewood in South Dakota. 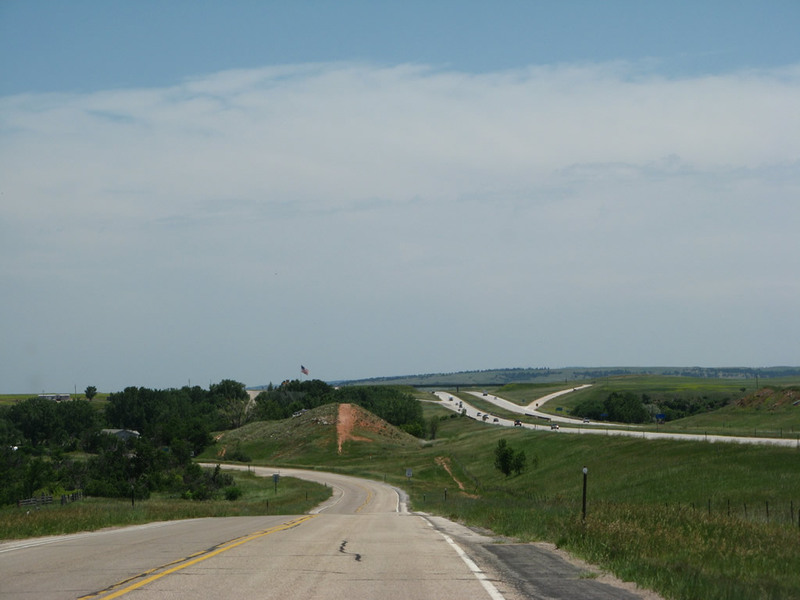 At Whitewood, South Dakota 34 meets Interstate 90/U.S. 14. Photo taken 09/01/04. A small placard sign designates the junction of U.S. 14 and Wyoming 24 as Devils Tower Junction. Note the reduction of speed limit here as well as the limited services on the north side of the highway. Photo taken 09/01/04. 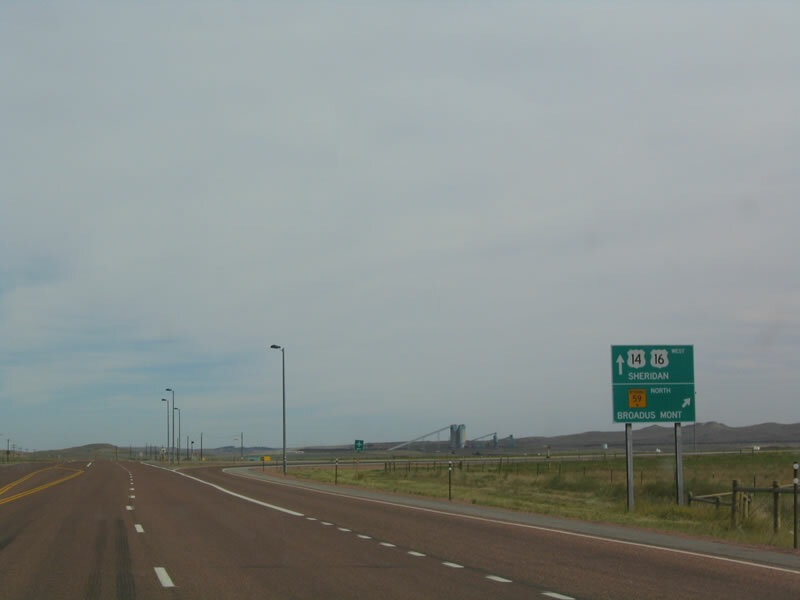 Eastbound U.S. 14 reaches the junction with Wyoming 24. Turn left (north) on Wyoming 24 to travel to Devils Tower and Hulett. 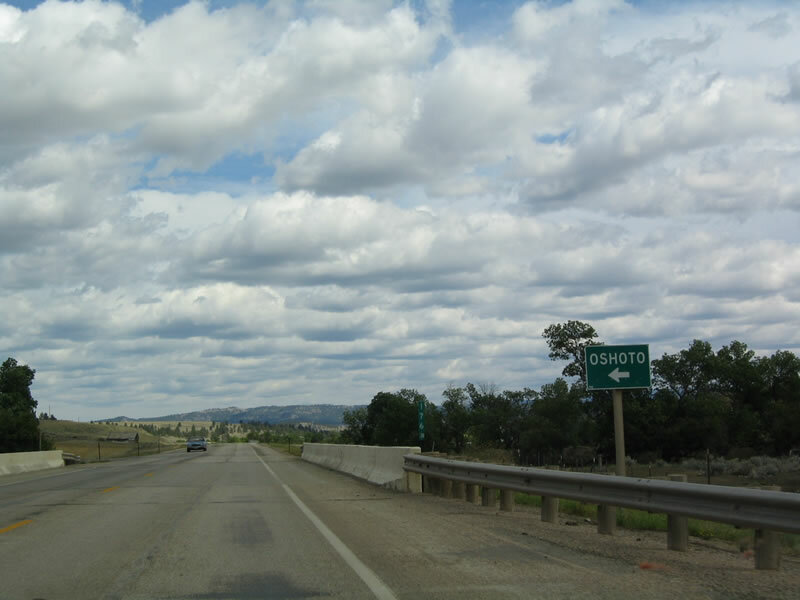 Continue straight ahead to return to Interstate 90 and travel to the city of Sundance, which is the seat of Crook County. 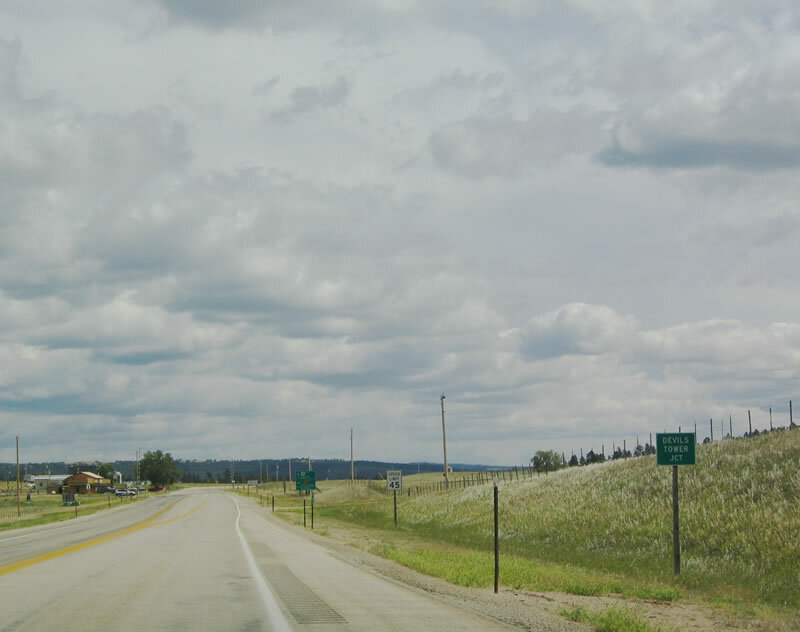 At Sundance, U.S. 14 will again merge onto Interstate 90, and they will remain merged through much of western South Dakota, until they separate near Exit 111 in Wall. Photo taken 09/01/04. For photos, see Eastbound Interstate 90 Wyoming in Crook County. 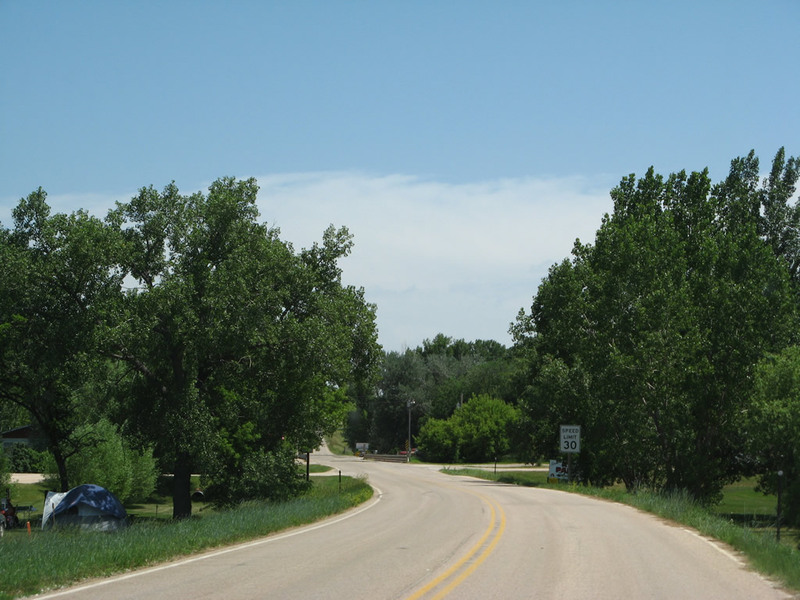 Old U.S. 14 is maintained as an unnumbered state highway that functions primarily as the Interstate 90 frontage road between Sundance and Beulah. 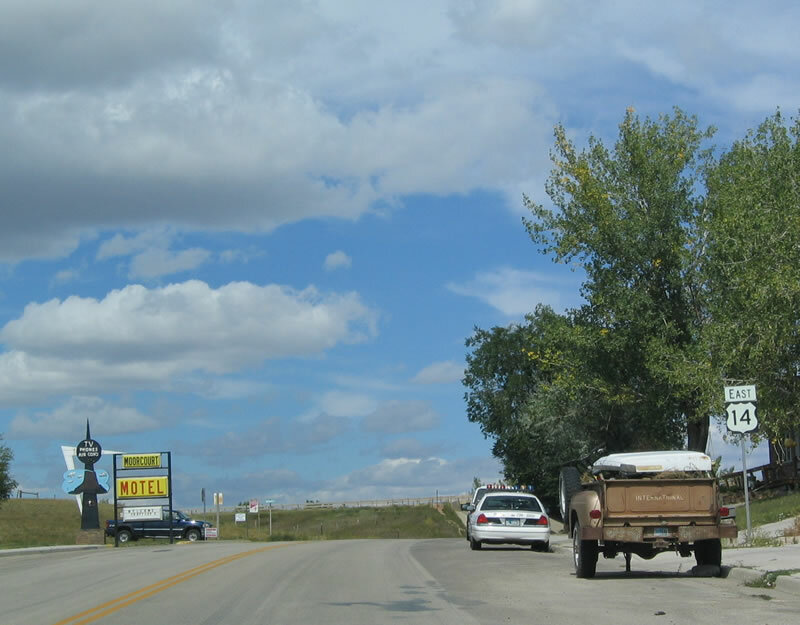 This view looks east along Old U.S. 14 after the Wyoming 111 intersection (near Interstate 90 Exit 199). Ahead on the right is the Northeast Wyoming Information Center, which opened on July 16, 2010.1 Prior to the opening of the information center, this was an undeveloped hillside. Photo taken 08/16/11. Eastbound Old U.S. 14 meets the connecting road to the Northeast Wyoming Information Center. Turn right at this driveway to the center, which has maps, restrooms, museum-quality exhibits, and information about local scenic and cultural attractions. Photo taken 08/16/11. 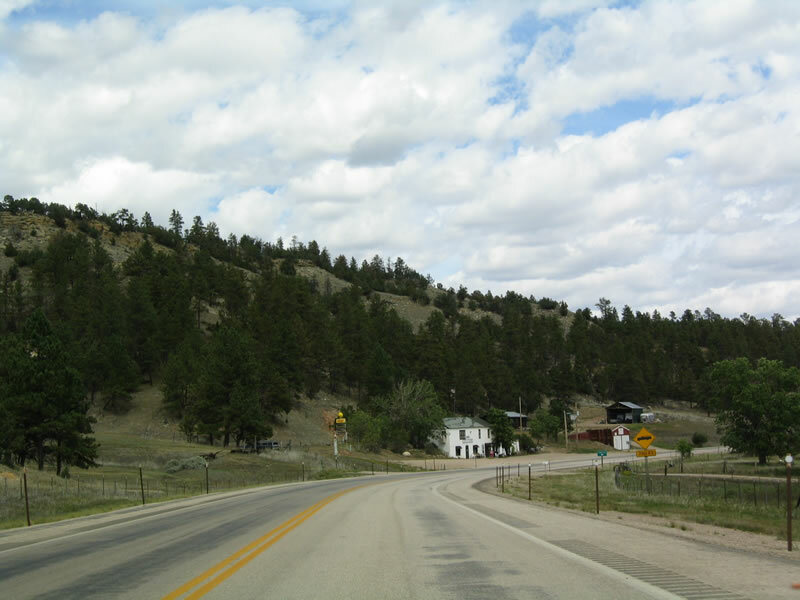 Before the Northeast Wyoming Information Center was built, Old U.S. 14 continued east to the top of the hill unhampered. Photo taken 07/05/08. 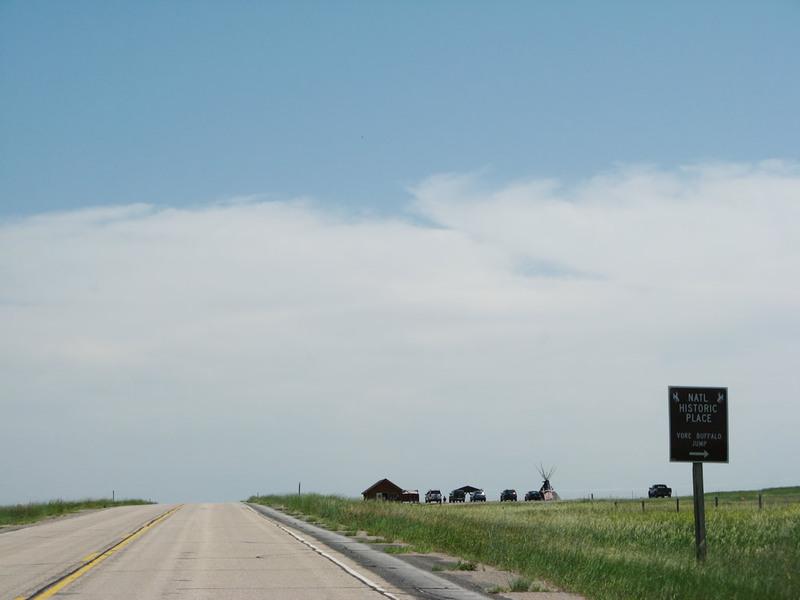 This series of pictures follows Old U.S. 14 (I-90 Frontage Road) between the Northeast Wyoming Information Center and Vore Buffalo Jump turnoff. Photos taken 07/05/08. Eastbound Old U.S. 14 meets the turnoff to the Vore Buffalo Jump. 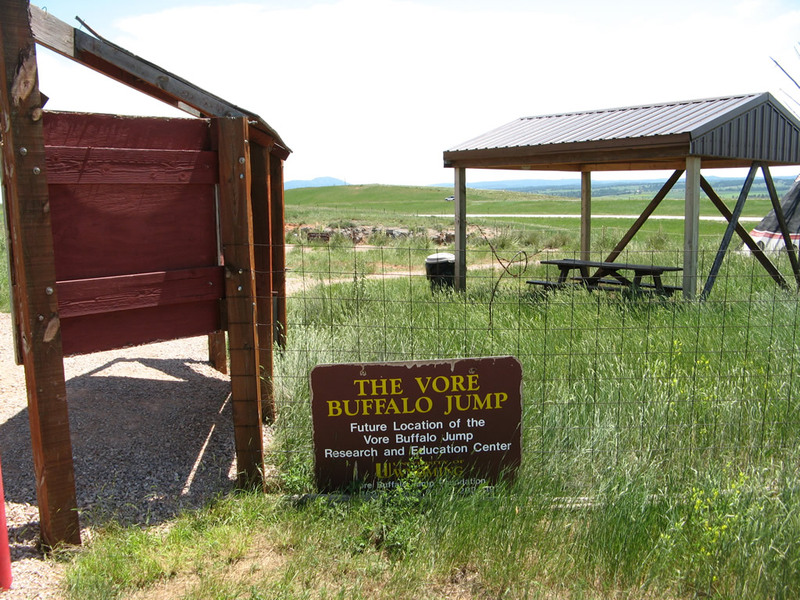 The Vore Buffalo Jump is a major archaeological site located between Old U.S. 14 and Interstate 90 on the north side of the freeway. Discovered when the Interstate 90 freeway was being constructed in the early 1970s, the Vore Buffalo Jump is "a natural sinkhole that was used as a bison trap from about 1500 to 1800 A.D. Buffalo were driven over the edge of the sink hole as a method for the Native American tribes to procure the large quantities of meat and hides needed to survive the harsh prairie winters." Students and scholars frequent the site to excavate old bones and continue to find the remains of animals. 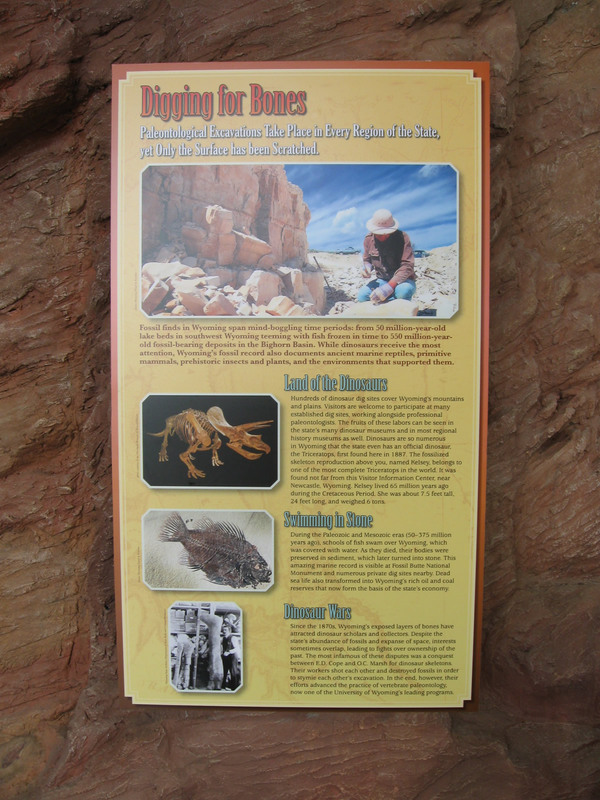 A visitors center and excavation site building (opened in July 2011) are available on site for visitors for a nominal fee. Photo taken 07/05/08. 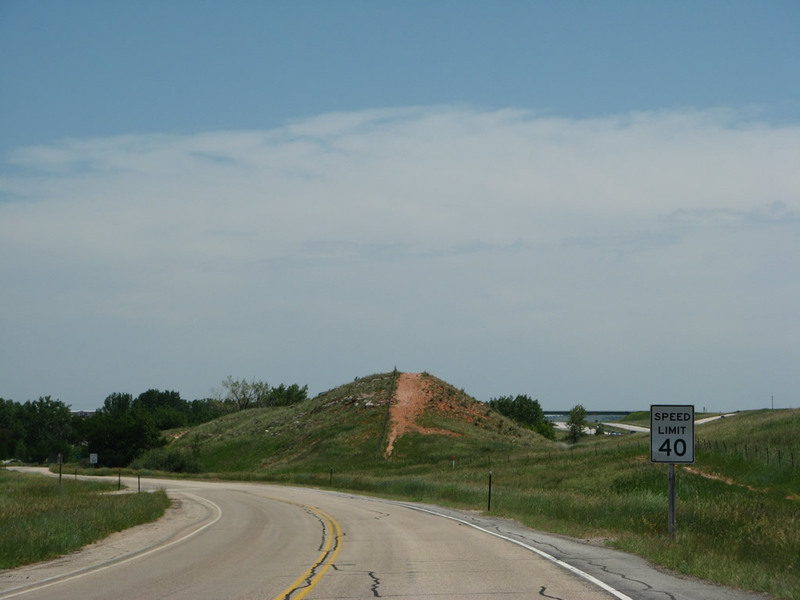 This series of pictures follows Old U.S. 14 west between the Vore Buffalo Jump and the community of Beulah near the Wyoming-South Dakota state line. The Beulah Interchange (Exit 205) on Interstate 90 comes into view from Old U.S. 14 as we proceed east. Photos taken 07/05/08. 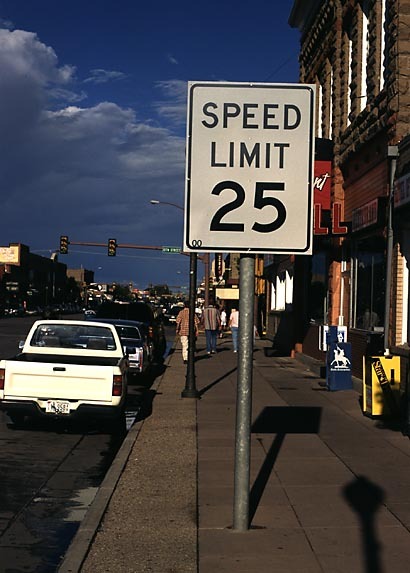 The speed limit on eastbound Old U.S. 14 drops to 40 miles per hour as we approach Beulah. Photo taken 07/05/08. 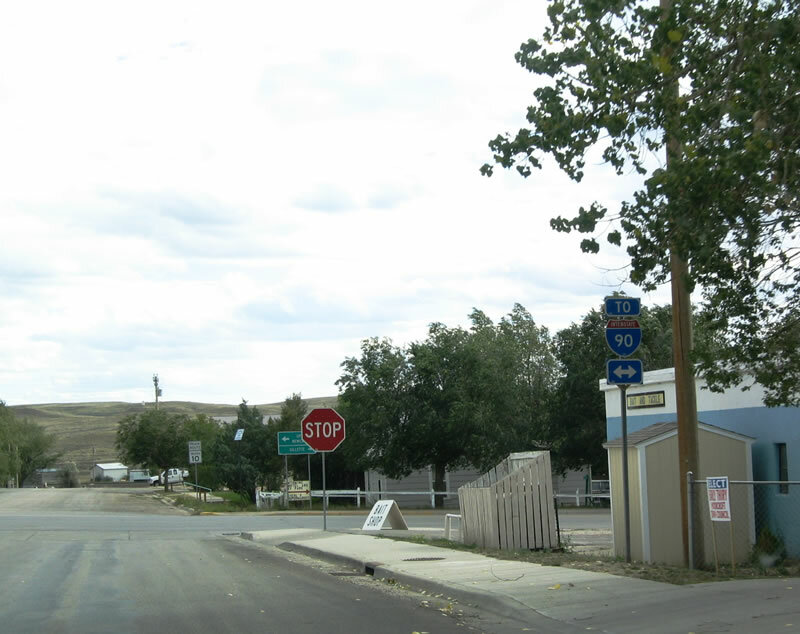 The community of Beulah, which sits at a rather low elevation by Wyoming standards (3,510 feet above sea level), had a population of 33 per the WyoDOT community entrance sign shown here. Photo taken 07/05/08. The speed limit again reduces as we approach the Redwater Creek bridge. Photo taken 07/05/08. Old U.S. 14 crosses over Sand Creek and Redwater Creek. 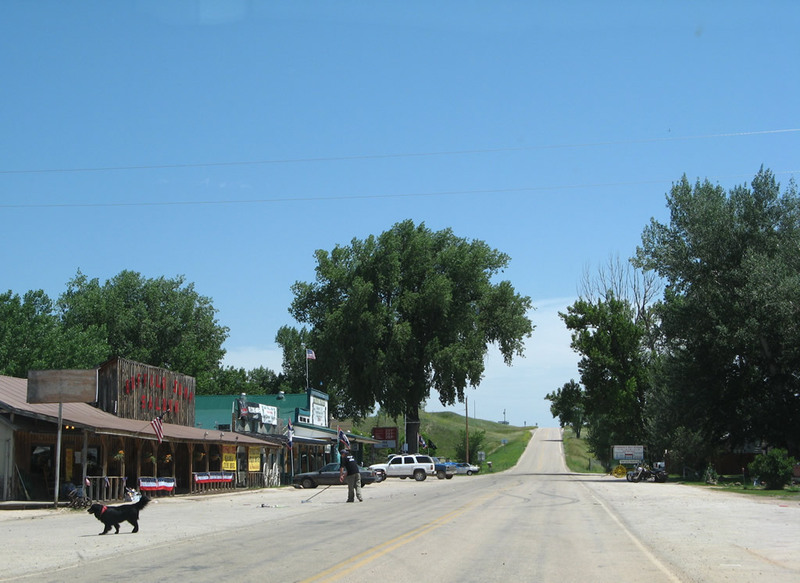 Then the highway enters the small downtown area of Beulah. Photo taken 07/05/08. Continuing east, we enter the small business area of Beulah. Photo taken 07/05/08. Ahead, Old U.S. 14 will leave the valley and approach the Beulah truck stop. Photo taken 07/05/08. On the right of Old U.S. 14 is the Beulah truck stop, which offers food, gas, and phone. Access to Interstate 90 is provided by continuing to the top of the hill, then making a right on Sand Creek Road. Photo taken 07/05/08. Eastbound Old U.S. 14 approaches Sand Creek Road (Crook County Route 129). 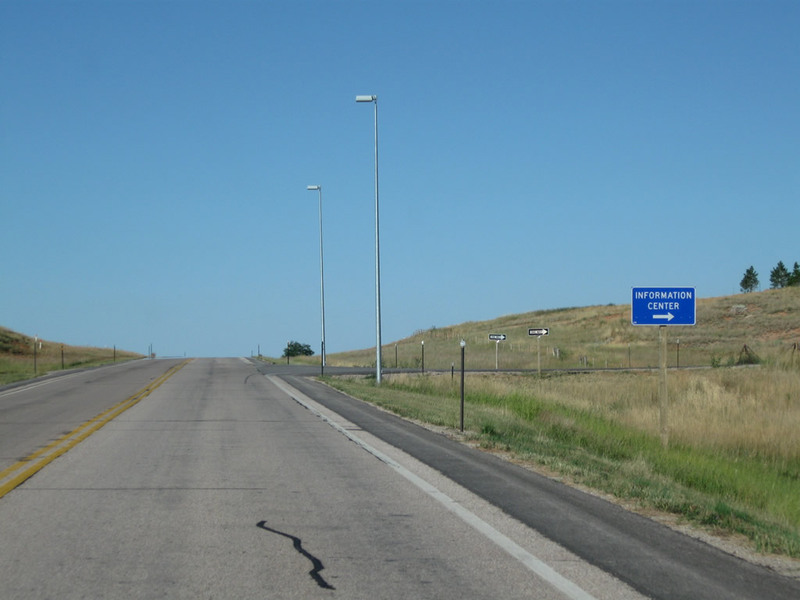 A trailblazer points the way to Interstate 90 and U.S. 14 east to Spearfish and Rapid City and west to Sundance and Gillette. Photo taken 07/05/08. 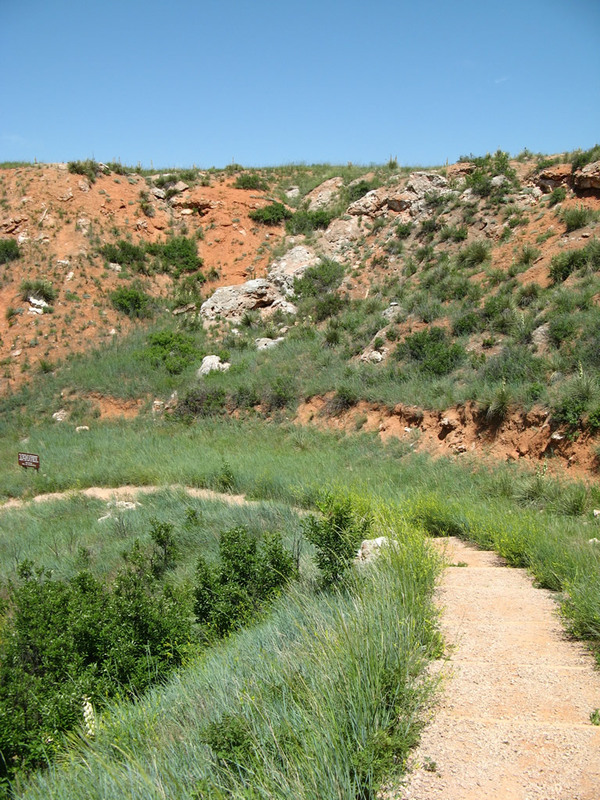 At the north end of Sand Creek Road is a trailblazer guide sign pointing the way to Beulah and the Vore Buffalo Jump. 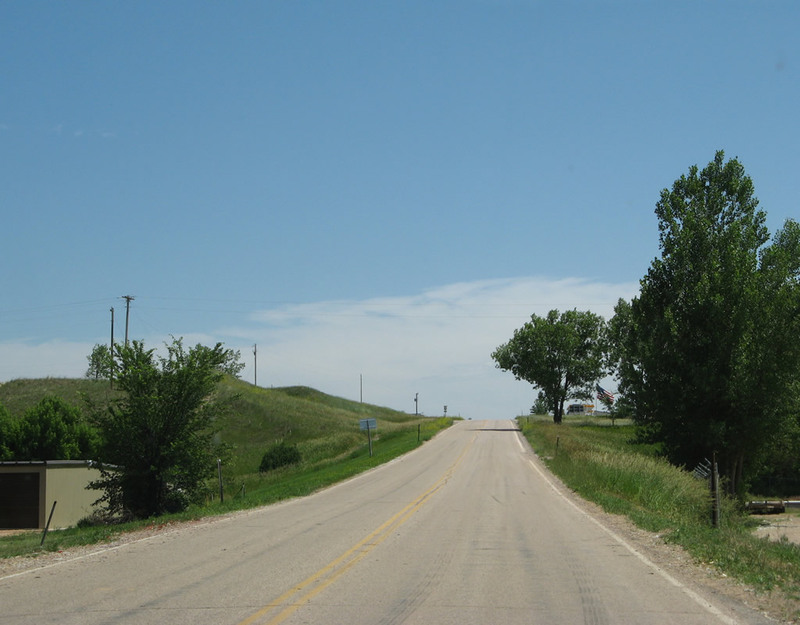 Ahead, Old U.S. 14 continues east into South Dakota. Photo taken 07/05/08. 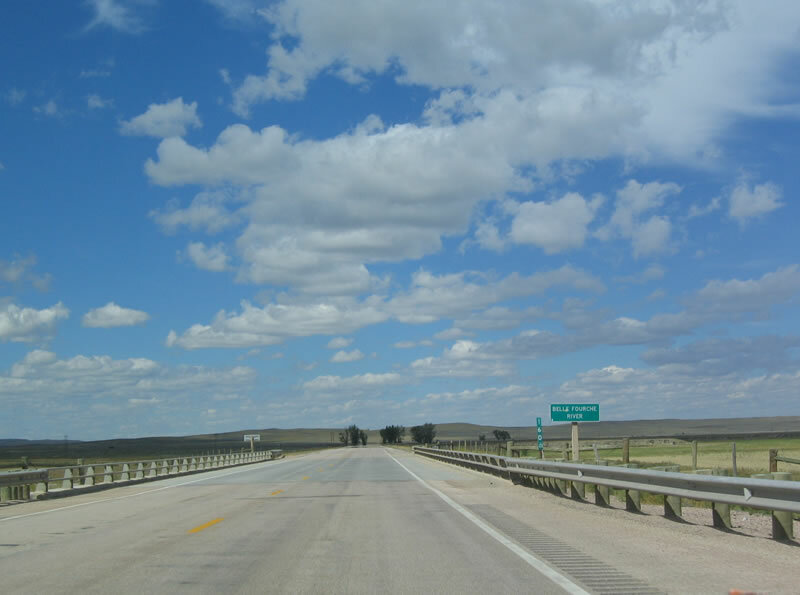 For photos, see Westbound Interstate 90 Wyoming in Crook County. Storm clouds gathered on this summer's afternoon along Old U.S. 14 between the Northeast Wyoming Information Center and the junction with Wyoming 111. Photo taken 08/13/10. The entrance to the Northeast Wyoming Information Center is located a short distance after passing by the large building. The next intersection is with Wyoming 111, which travels north to Aladdin and south to Interstate 90 and U.S. 14. Photo taken 08/13/10. A supplementary sign points the way to Aladdin via Wyoming 111 north. Photo taken 08/13/10. Westbound U.S. 14 enters the town of Moorcroft (elevation 4,206 feet above sea level) in western Crook County. Home to 807 people (per the 2000 Census), the town has an economy based on mining, ranching, and tourism. Photo taken 09/03/04. Now in Moorcroft, U.S. 14 approaches its junction with U.S. 16 and Business Loop I-90 (Converse Street). Moorcroft, which is Old Gaelic for "Cottage on the Plains," was founded on October 2, 1906. 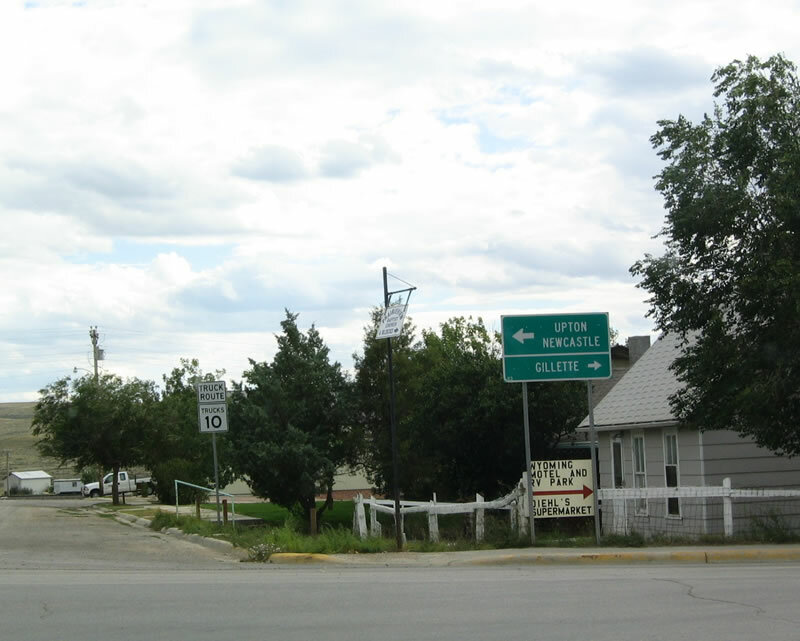 The town is notable as the location where Interstate 90 and U.S. 14-16 cross the Old Texas Trail. The town is located on the banks of the Belle Fourche River, and the railroad passes through town with dozens of trains passing through each day. Photo taken 09/03/04. 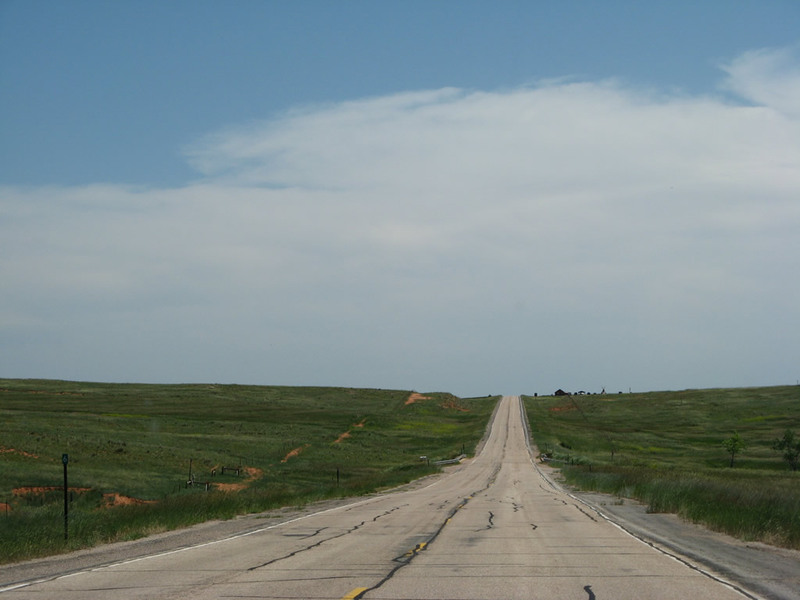 Follow U.S. 14-16 west to Gillette; the old road is also still in service as Wyoming 51. 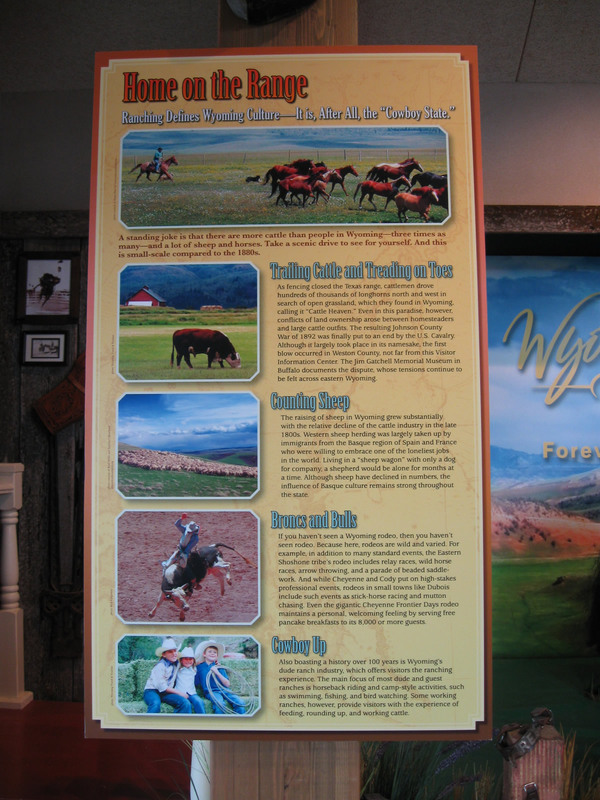 Wyoming 51 offers local connections to mines, industrial areas, ranches, and Wyodak. 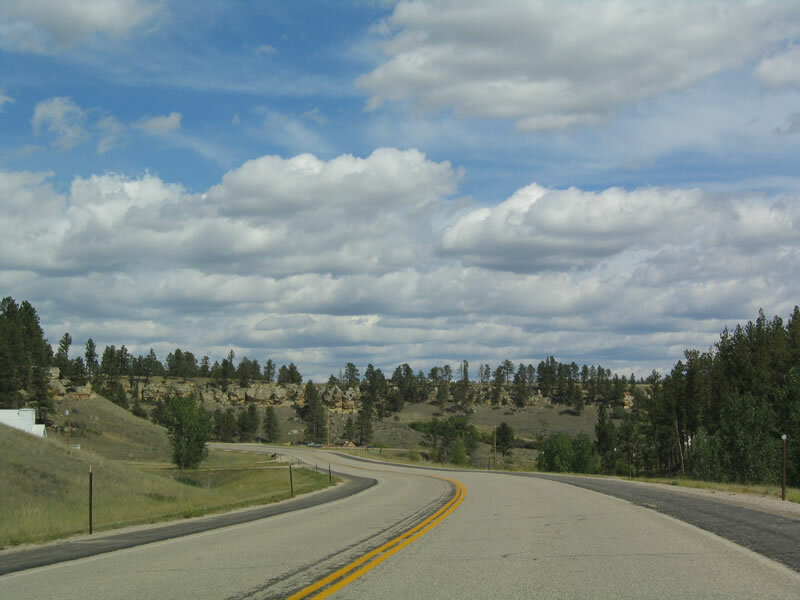 To the southeast, U.S. 16 aims toward Upton and Newcastle, then crosses into South Dakota en route to Jewel Cave National Monument and the city of Custer, which anchors the western Black Hills. Photo taken 09/03/04. Rather than use a green Business Loop I-90 shield here, a neutered Interstate 90 trailblazer shield correctly indicates that either direction of the business loop ultimately leads back to Interstate 90 east or west. Photo taken 09/03/04. Follow U.S. 16 east to Upton and Newcastle and U.S. 14-16 west to Gillette, Buffalo, Sheridan, Greybull, Cody, and Yellowstone National Park. 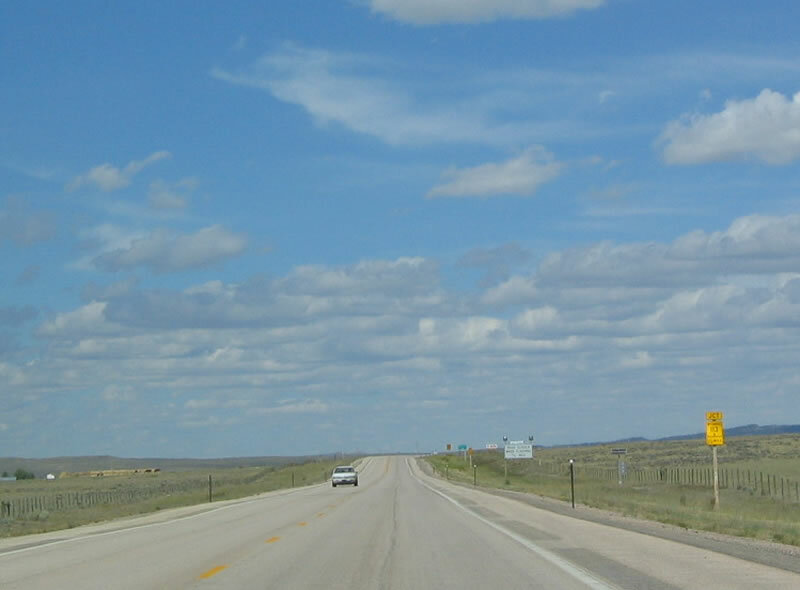 Both U.S. 14 and U.S. 16 end at the eastern boundary of Yellowstone National Park, which is a featured destination for many highway travelers who pass through Northeastern Wyoming. Photo taken 09/03/04. 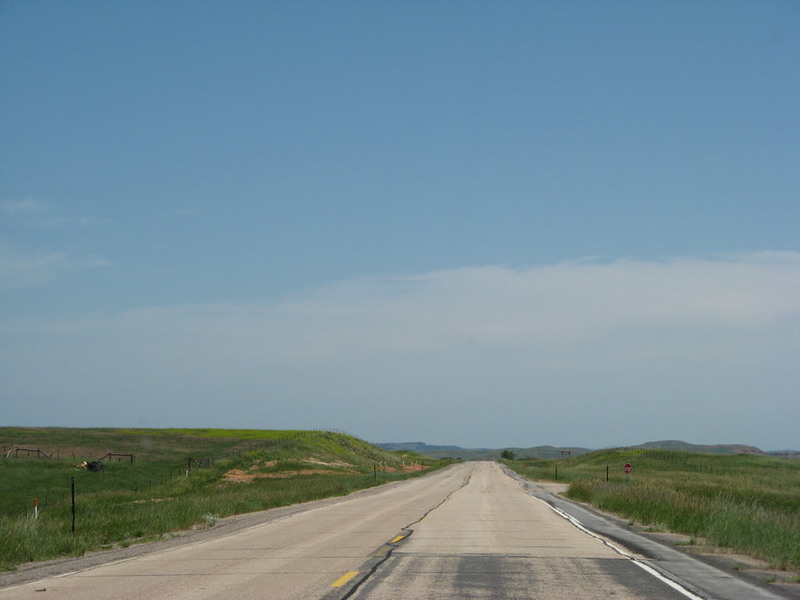 Westbound U.S. 14-16 split from northbound Wyoming 59 northwest of Gillette. U.S. 14-16 continue northwest toward Spotted Horse, Arvada, Leiter, Clearmont, and Ucross. Wyoming 59 travels north toward Broadus, Montana. The Powder River Basin is well known nationally as an area of energy reserves, including coal. The surrounding infrastructure reflects this in many ways, some more subtle than others. 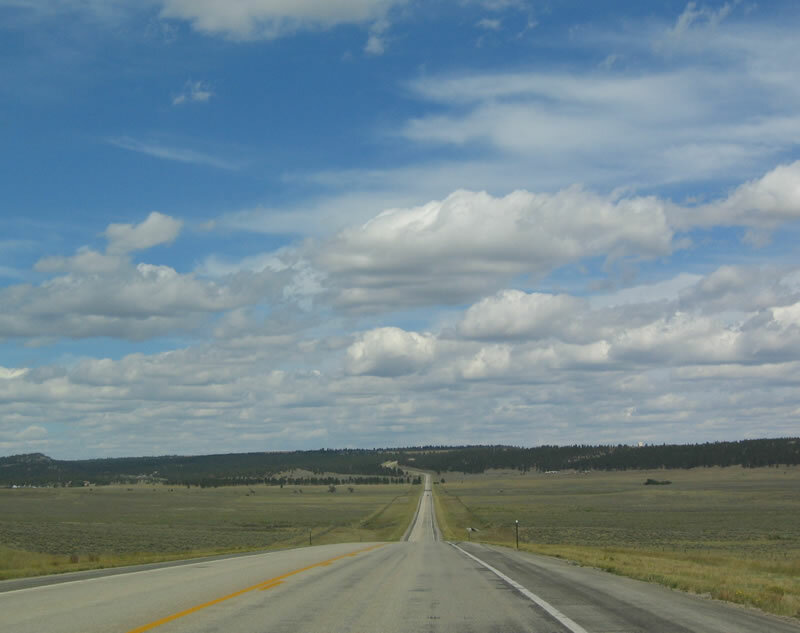 According to Discover America: Wyoming by Nathaniel Burt (1991 edition, page 169), many of the roads in and around Gillette are built of crushed "clinker," which is a red-colored rock that is created when coal is burned underground. Photo taken 09/03/04. In Burgess Junction west of Ranchester, westbound U.S. 14 prepares to split with Alternate U.S. 14. U.S. 14 turns south and then west to Granite Pass (elevation 8,950 feet) and descends into the Big Horn Basin via Shell Canyon. The route is very pretty, and it offers a direct route to Greybull and onward to Cody. 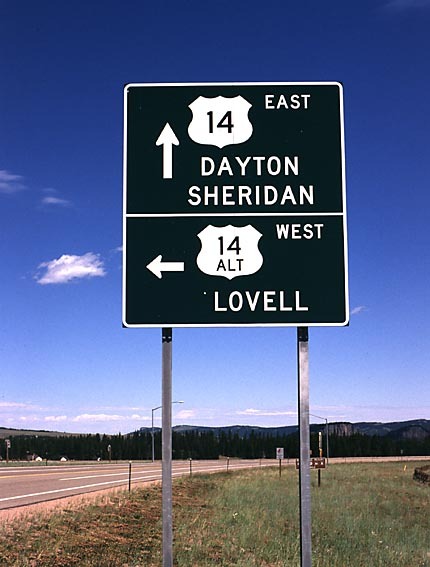 Alternate U.S. 14 is less direct, as it chooses to remain north, traveling toward Lovell and Powell via Medicine Wheel and Bighorn National Recreation Area. However, Alternate U.S. 14 provides some outstanding views as it travels near the alpine tree line, then travels downhill in a hurry. Either road is a good one for through traffic to Yellowstone National Park. Photo taken by Jonathan Winkler, 8/00. Westbound U.S. 14 reaches Junction Alternate U.S. 14 in Burgess Junction. Since both Shell Canyon (via U.S. 14) and Medicine Wheel (via Alternate U.S. 14) are worth seeing on this journey, travelers may wish to drive to either attraction first, then circle back to Burgess Junction to visit the other area. Photo taken by Jonathan Winkler, 8/00. In Cody, westbound U.S. 14-16-20 and Wyoming 120 prepares to split along 18th Street and Sheridan Avenue. 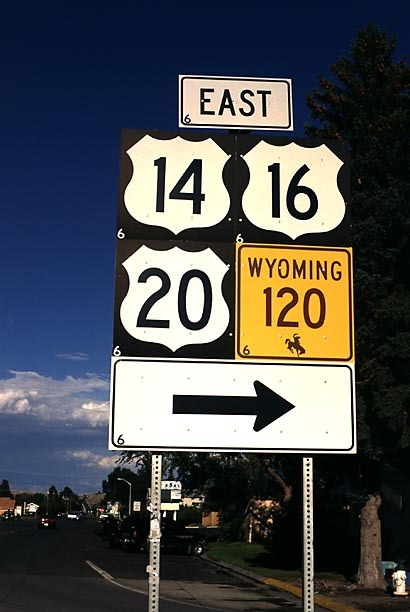 Wyoming 120 is signed as an east-west route, but westbound really travels north from here into Montana. 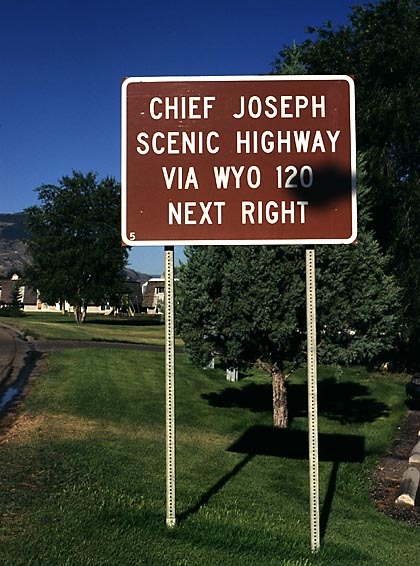 Use Wyoming 120 west (north) to reach Wyoming 296, the scenic Chief Joseph Highway. 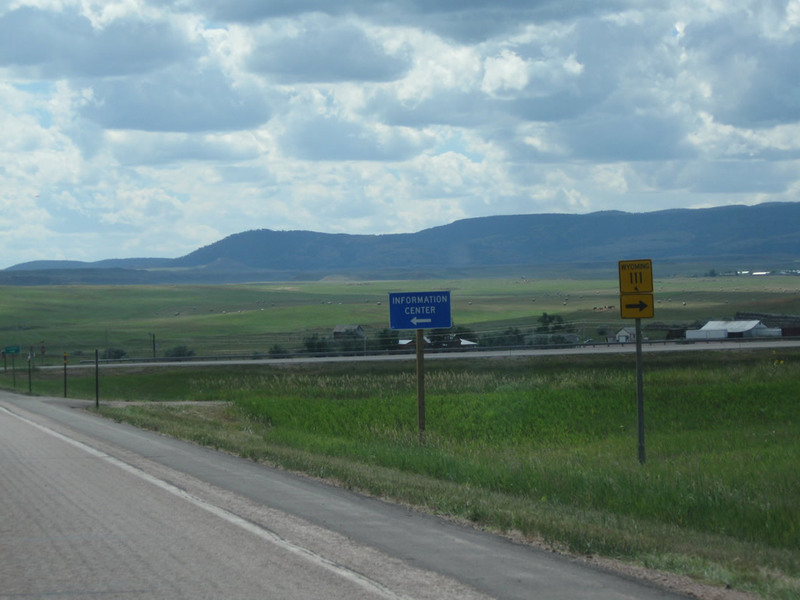 At the state line, it changes into northbound Montana 72. Photo taken by Jonathan Winkler, 08/11/00. 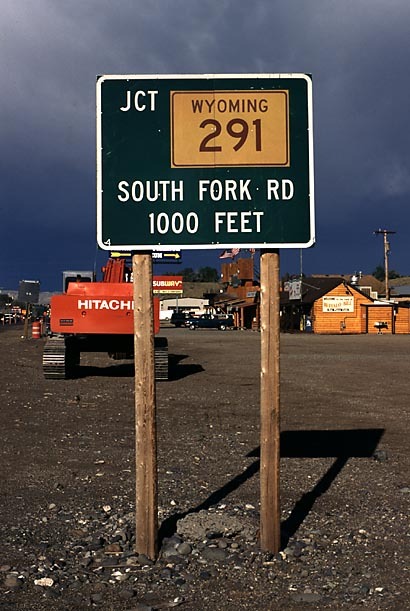 Shortly after the junction sign in the previous photobox, this brown recreational sign along westbound U.S. 14-16-20 indicates that Wyoming 120 west (north) connects to Wyoming 296, Chief Joseph Highway. Wyoming 296 travels northwest from Wyoming 120 over Dead Indian Summit (Elevation 8,060 feet) to meet U.S. 212 (Beartooth Highway) southeast of Cooke City and southwest of Red Lodge, both of which are towns in Montana. Photo taken by Jonathan Winkler, 08/11/00. 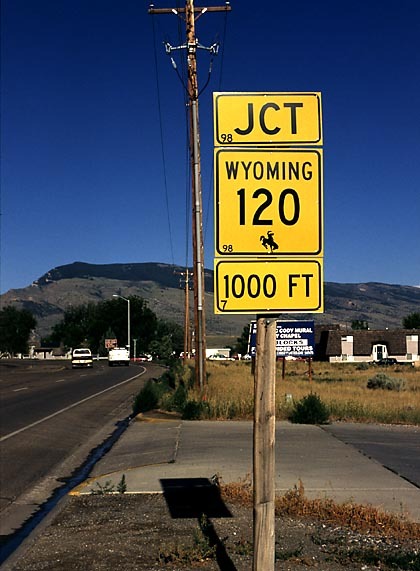 Use Wyoming 120 west (north) to Clark, the Chief Joseph Highway, and Belfry, Montana. 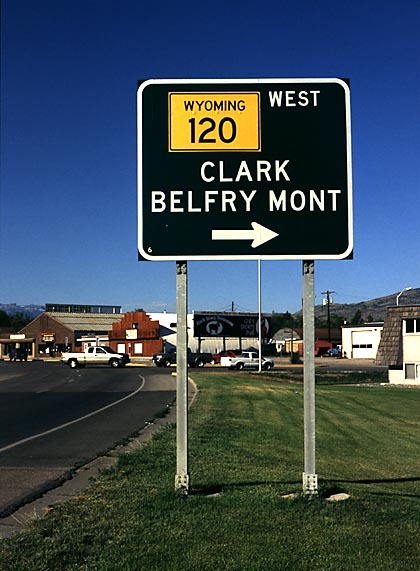 At Belfry, Montana 72 intersects Montana 308. North of there, Montana 72 angles into U.S. 310 south of Laurel, and it ultimately connects with Interstate 90. Montana 308, meanwhile, travels west from Belfry to Red Lodge, where it meets U.S. 212 (Beartooth Highway). Photo taken by Jonathan Winkler, 08/11/00. 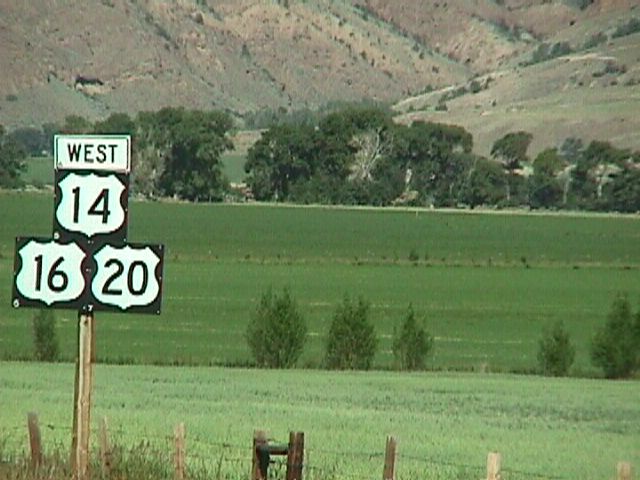 These U.S. 14-16-20 westbound shields are located in Shoshone Canyon west of Cody. Some of the areas in Shoshone Canyon (near Wapiti) are irrigated for agricultural use, while tall mountains surround the valley. West of here, U.S. 14-16-20 enter the Shoshone National Forest, which was the first national forest to be designated in the United States. President Benjamin Harrison created the new national forest on March 30, 1891. Photo taken by Jim Teresco, 07/26/99. At this point, U.S. 14-16-20 west enters Yellowstone National Park. This marks the western terminus of U.S. 14 and U.S. 16, but there is no end shield posted here. 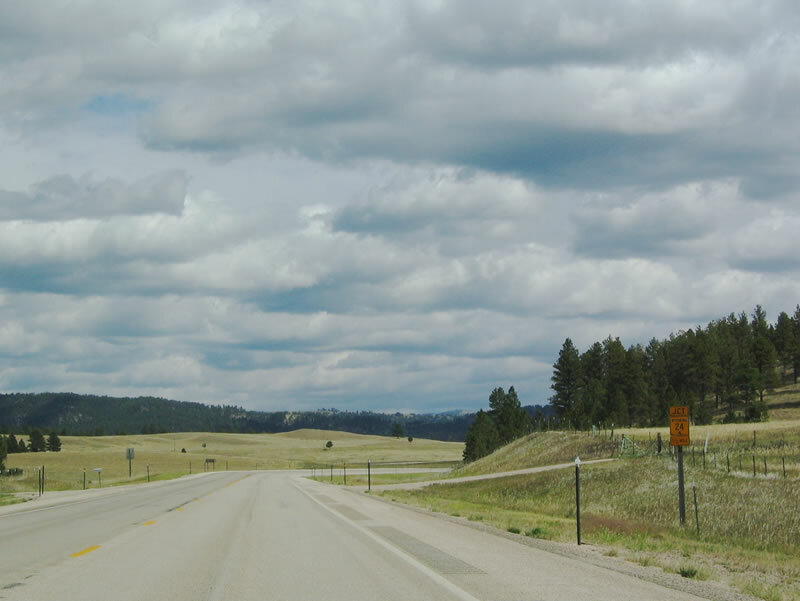 U.S. 20 also ends here, but it resumes in West Yellowstone, Montana, which creates a route break through the national park. The 1989 U.S. Numbered Highway Route Log published by AASHTO includes a break in the route. Photo taken by Jim Teresco, 07/26/99. 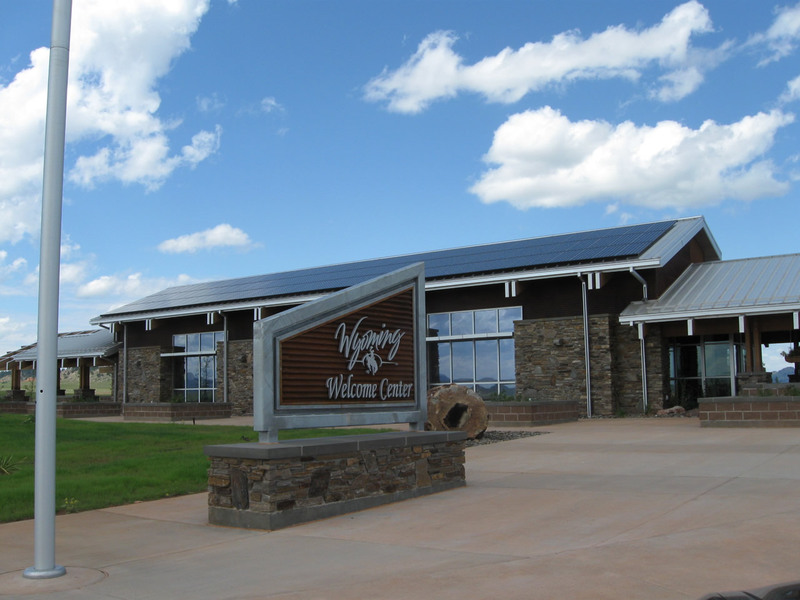 The Northeast Wyoming Information Center contains a vast treasure trove of local and regional activities not only in the Wyoming Black Hills and Powder River Basin but also throughout the state. 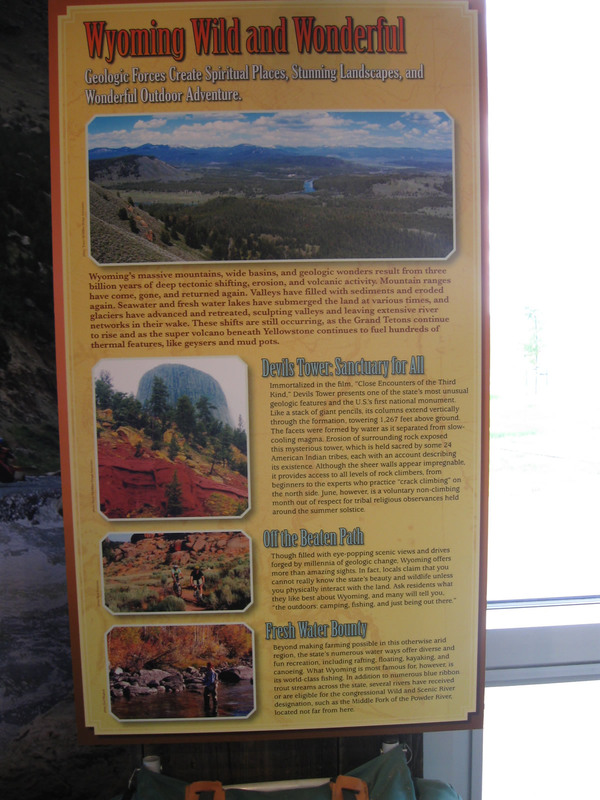 Exhibits depict various scenic areas of interest as well as cultural artifacts and Native American history. 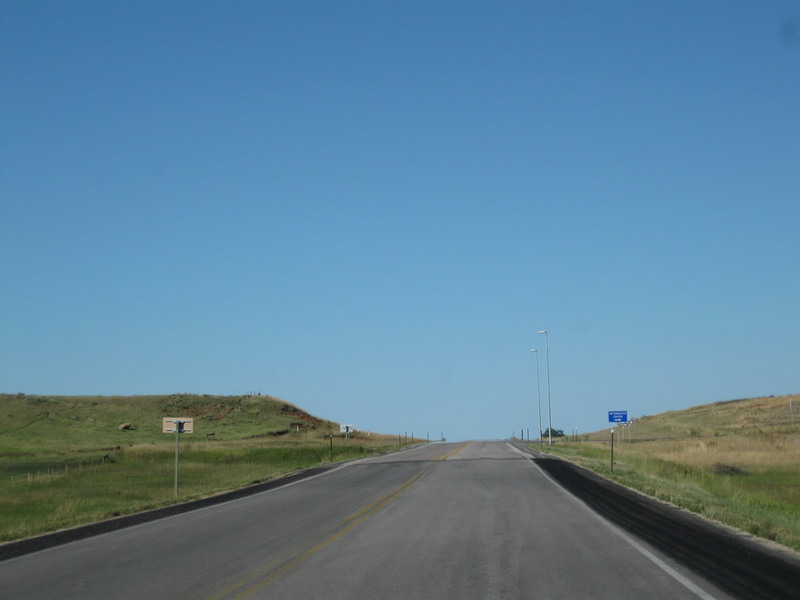 The center sits on a hill between Old U.S. 14 (I-90 Frontage Road) near the Wyoming 111 interchange (Interstate 90 Exit 199) and the Interstate 90/U.S. 14 freeway. 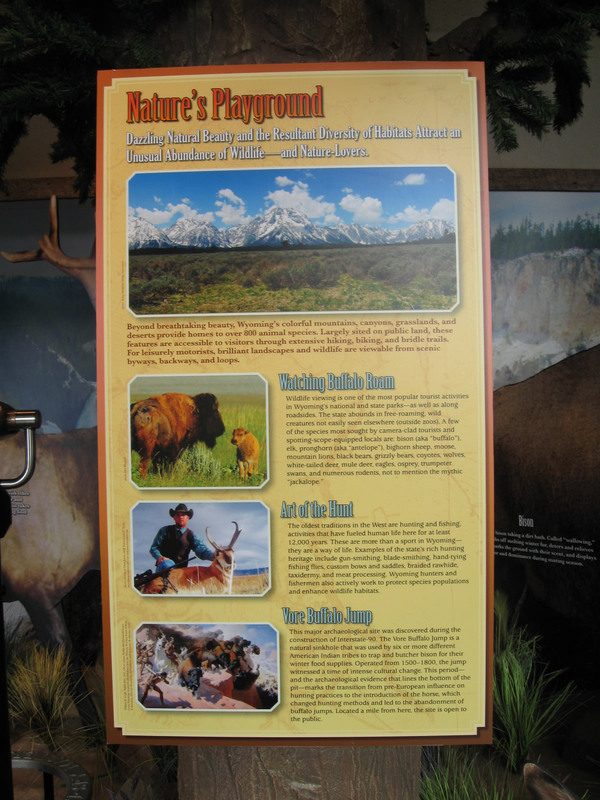 The excellent exhibits provide an overview of the unique nature of Wyoming, the Equality State. Photos taken 08/12/11 and 08/13/10. 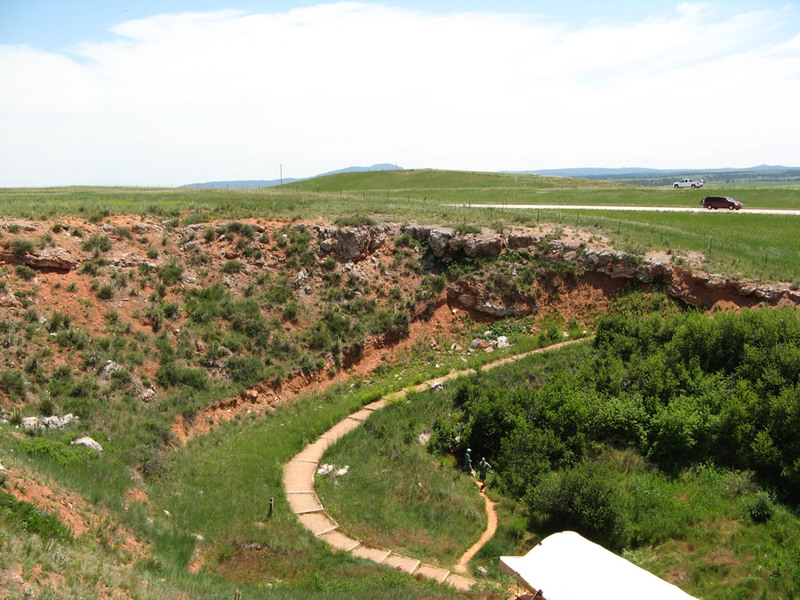 The Vore Buffalo Jump is a major archaeological site located between Old U.S. 14 and Interstate 90 on the north side of the freeway. Discovered when the Interstate 90 freeway was being constructed in the early 1970s, the Vore Buffalo Jump is "a natural sinkhole that was used as a bison trap from about 1500 to 1800 A.D. Buffalo were driven over the edge of the sink hole as a method for the Native American tribes to procure the large quantities of meat and hides needed to survive the harsh prairie winters." Students and scholars frequent the site to excavate old bones and continue to find the remains of animals. A visitors center and excavation site building (opened in July 2011; not shown in this series of pictures) are available on site for visitors for a nominal fee. 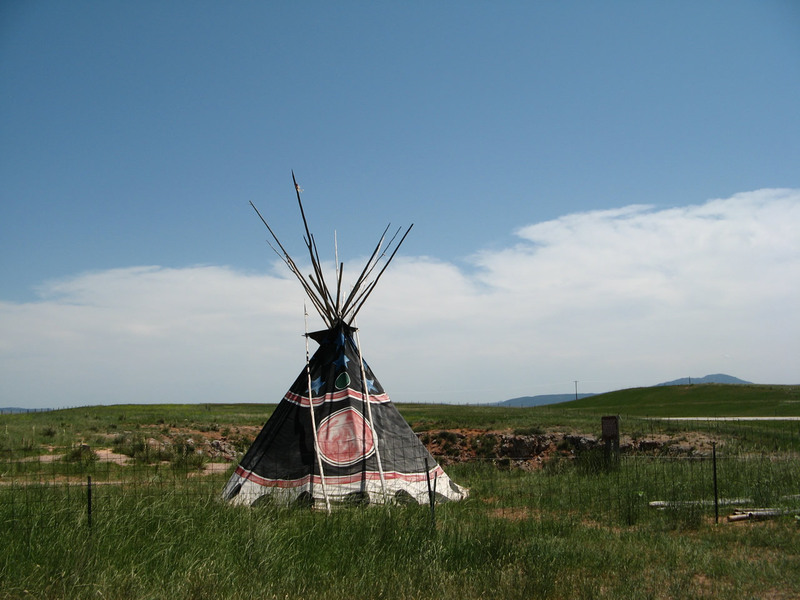 The teepee makes it easy to locate the buffalo jump when driving by on Interstate 90. Photos taken 07/05/08. 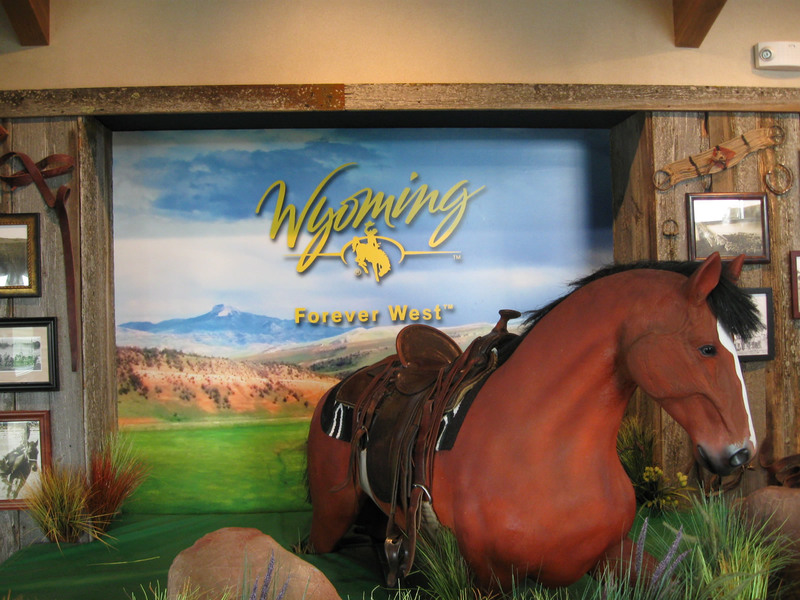 In 2010, the Wyoming Tourism slogan was "Forever West." 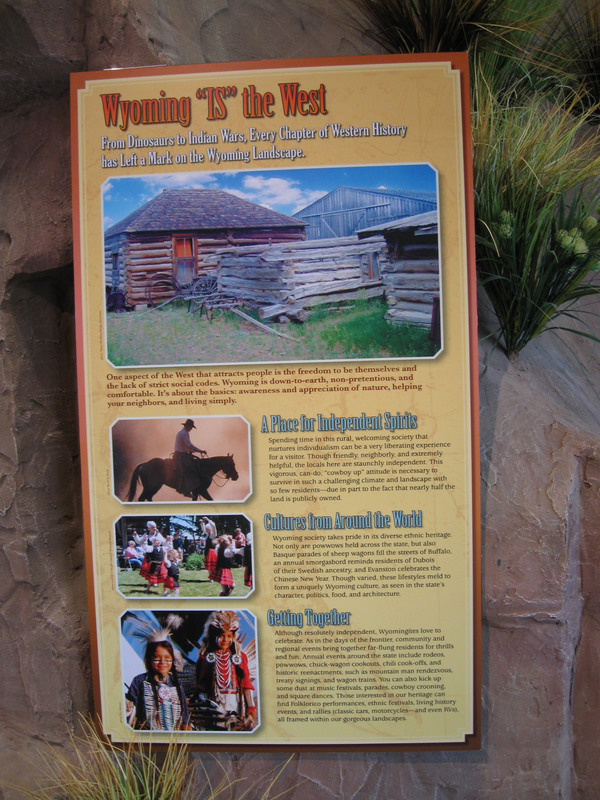 A small display including a mountable horse was available inside the Northeast Wyoming Information Center. Photo taken 08/13/10. 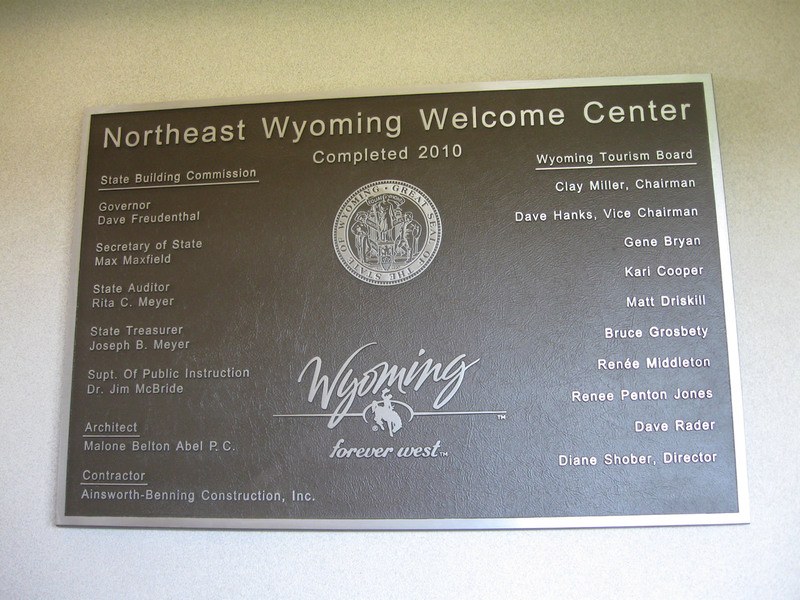 A Grand Opening for the Northeast Wyoming Welcome Center - press release dated July 7, 2010 by Diane Shober, which states, "The newest gateway to Wyoming will be on display for its grand opening at 3:00 p.m. on July 16, 2010; located off I-90 at exit 199. 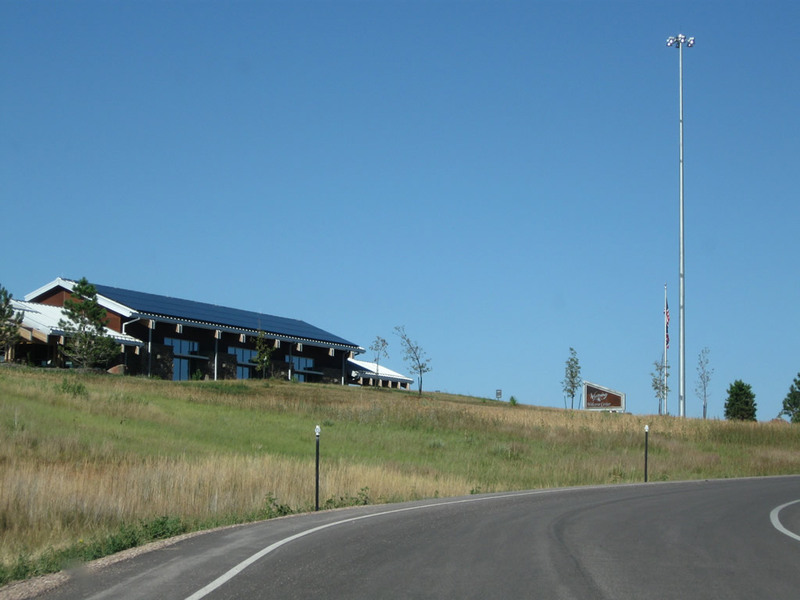 Governor Dave Freudenthal will lead the ribbon cutting ceremony for the new state-of-the-art welcome center that is expected to greet millions of visitors traveling from Mount Rushmore and the Black Hills of South Dakota to Wyoming&apos;s national parks and monuments."